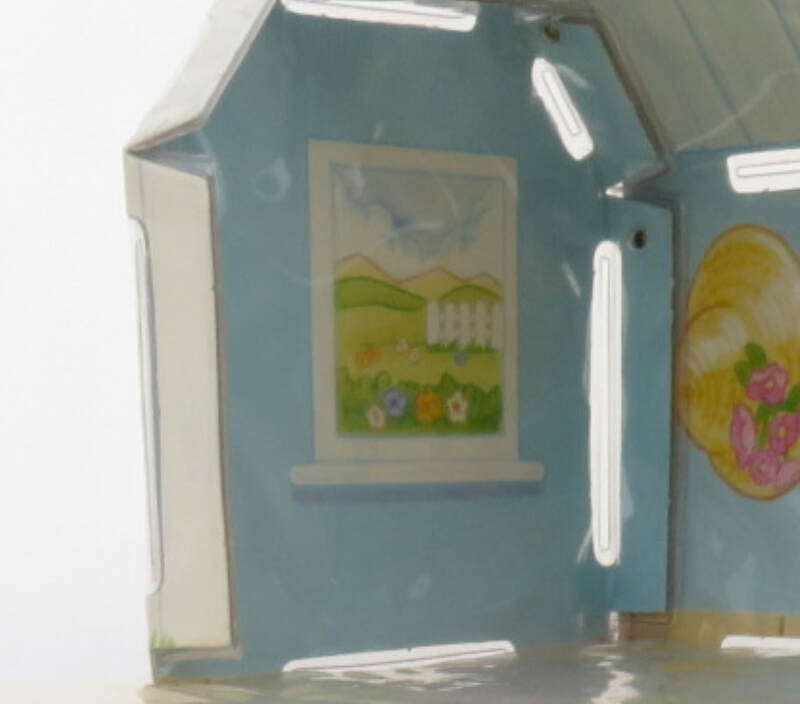 Designed to resemble the Dream Castle. 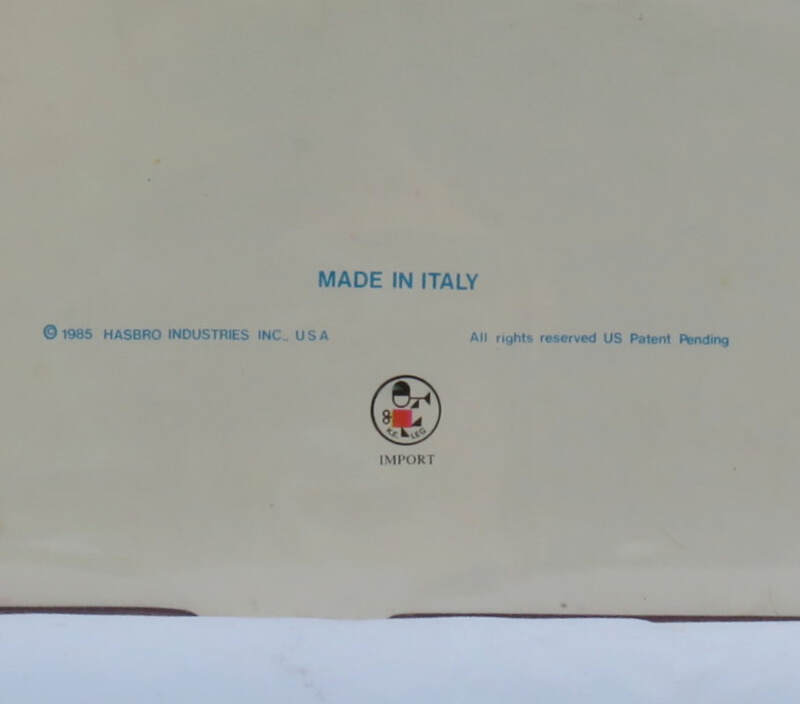 It has a yellow handle like the first edition US Carry Case. 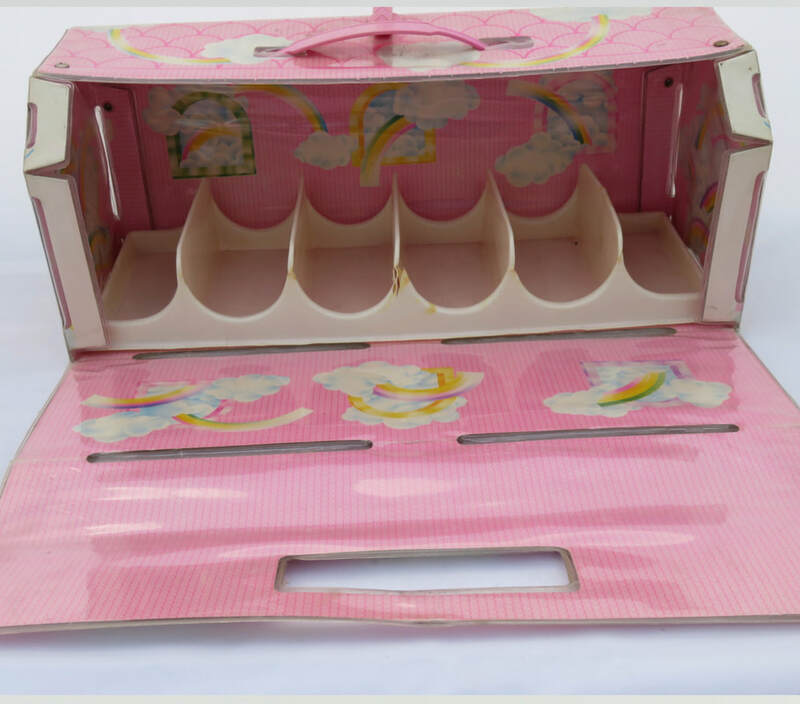 Inside are thin plastic stalls which seem to be the same as the smaller Carry Case although the case is wider. 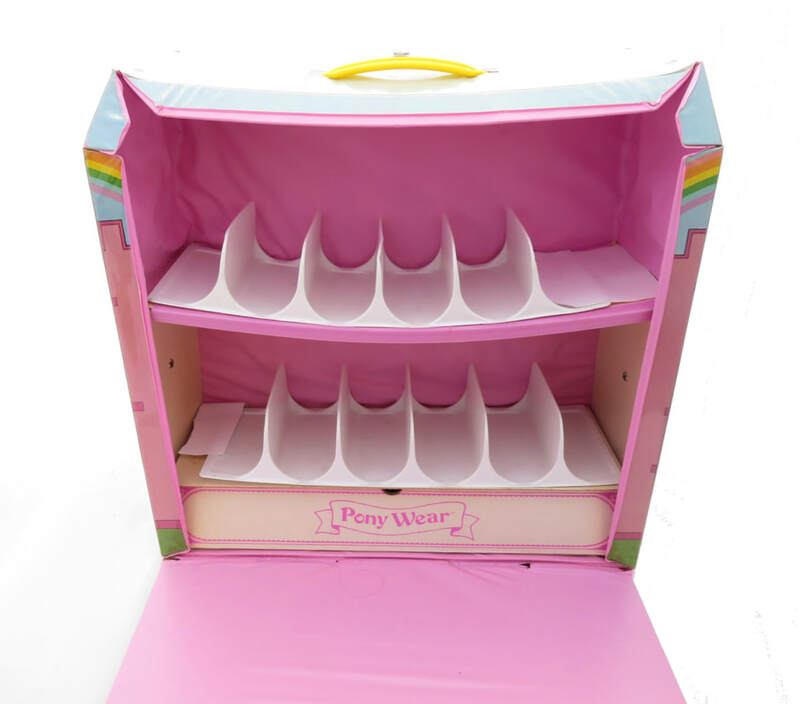 There's a section at the bottom labelled "Pony Wear" with a cardboard door that folds down. 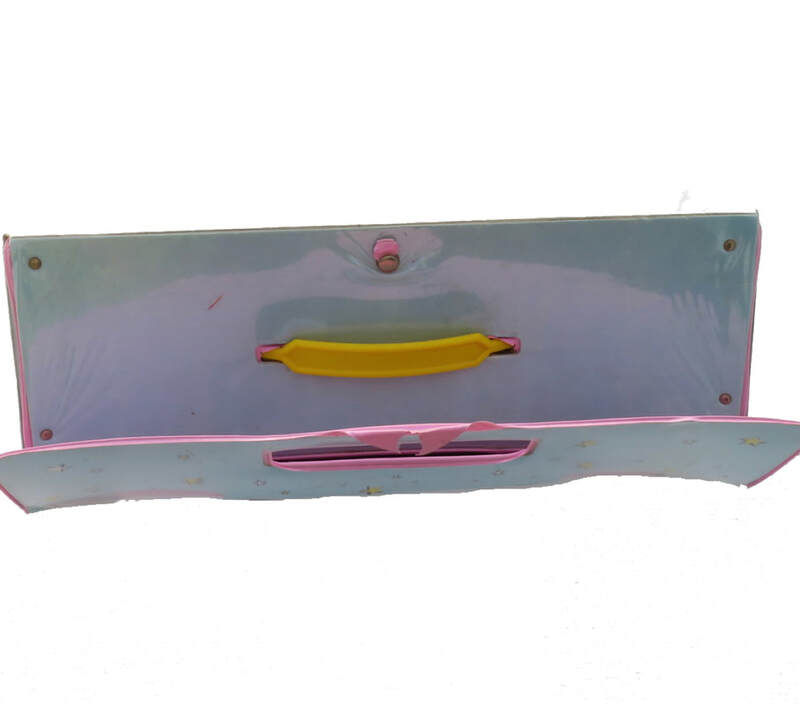 Its secured at the top with a single push stud in the middle - the one pictured has been ripped off. 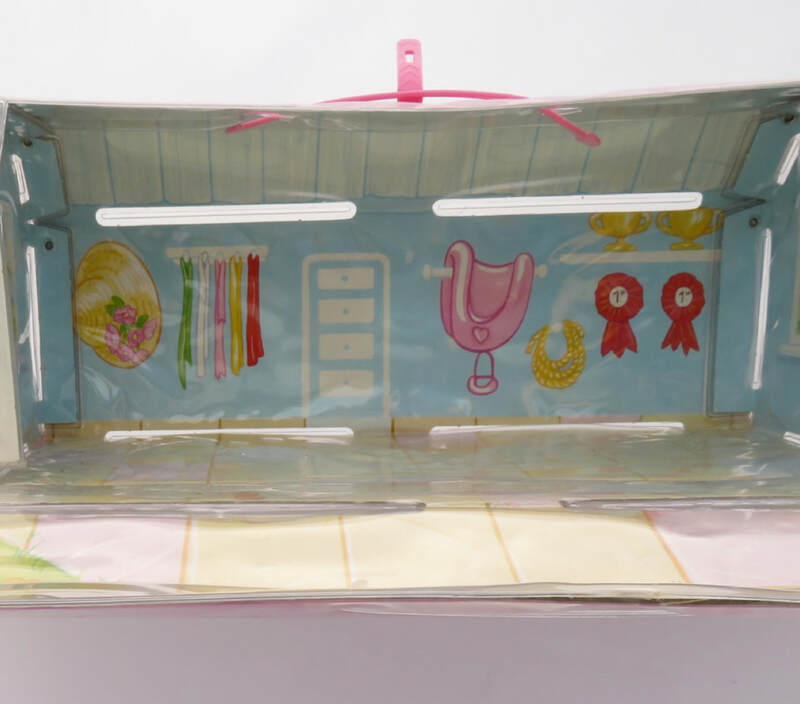 Inside - Showing stalls and Pony Wear Compartment. 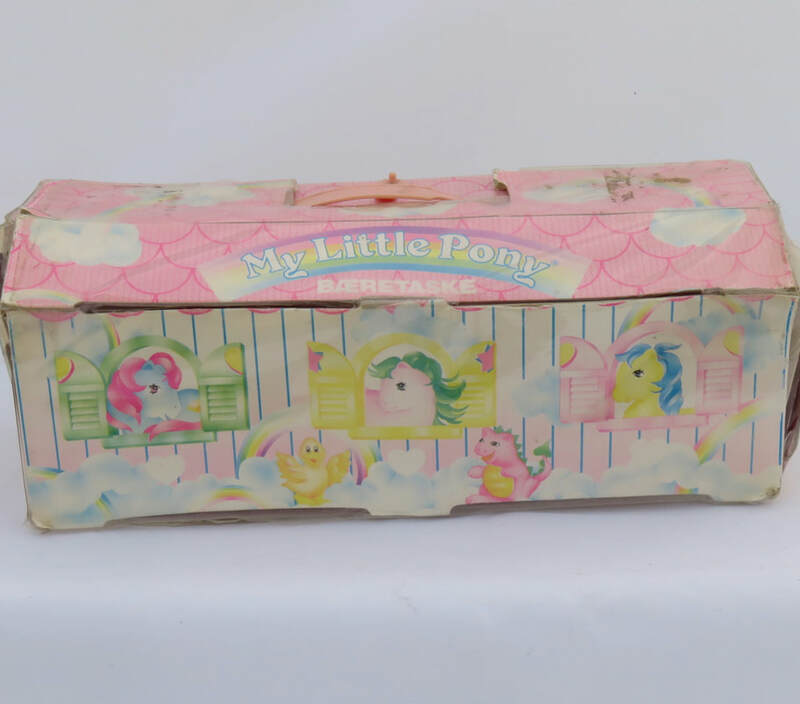 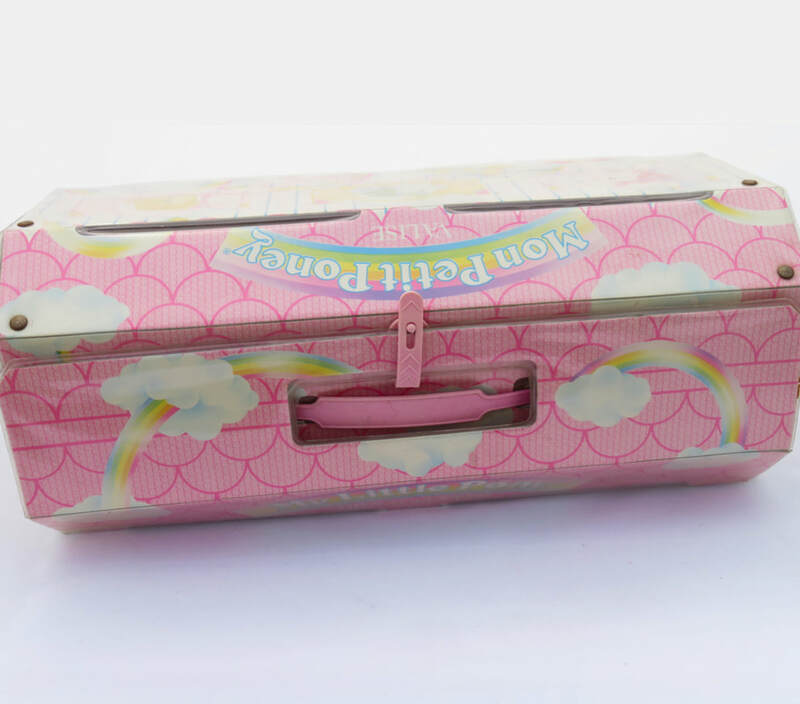 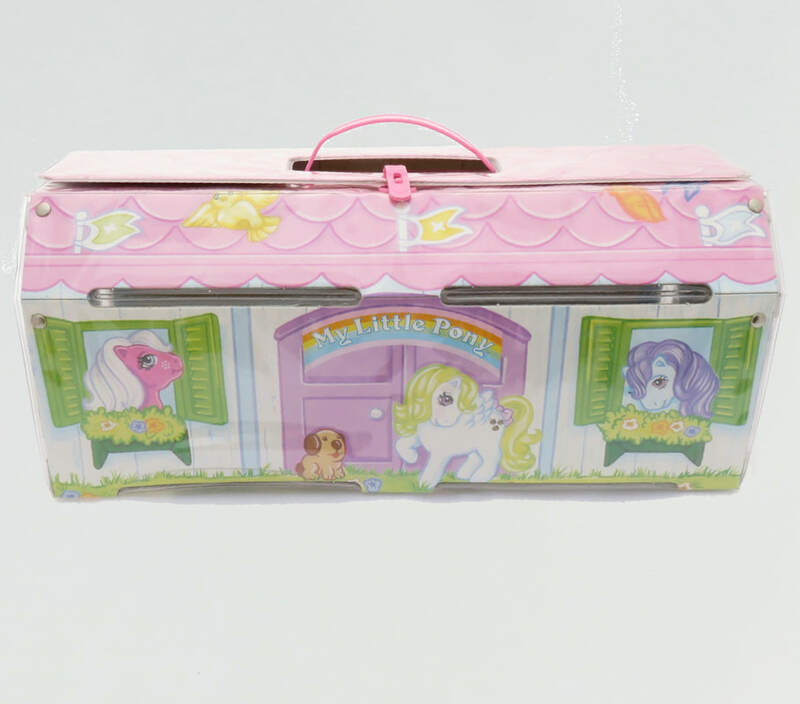 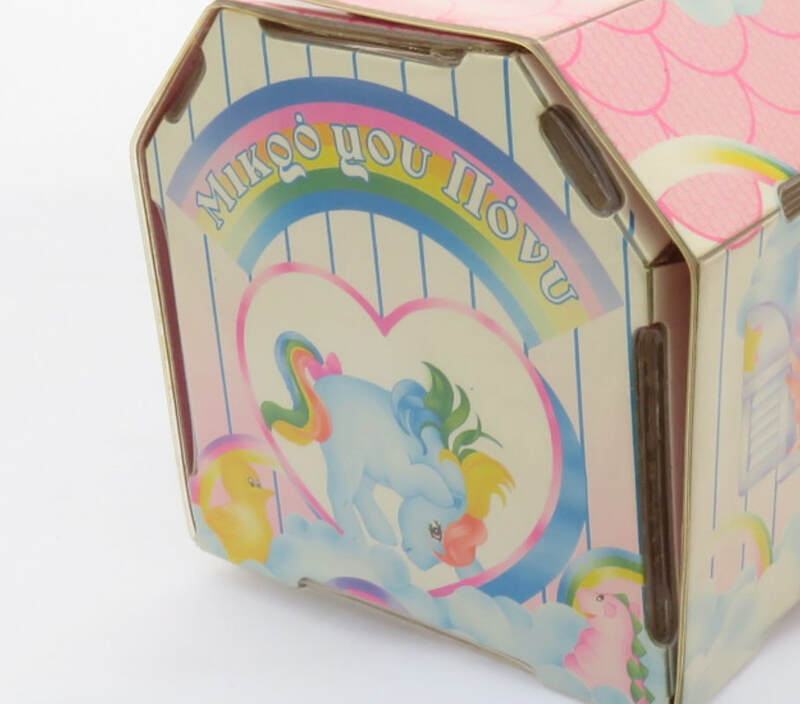 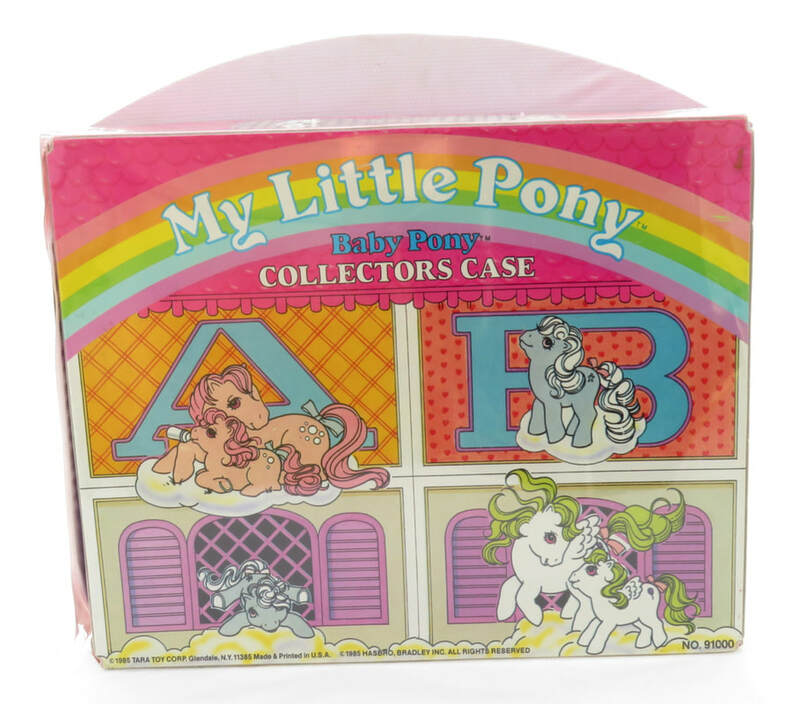 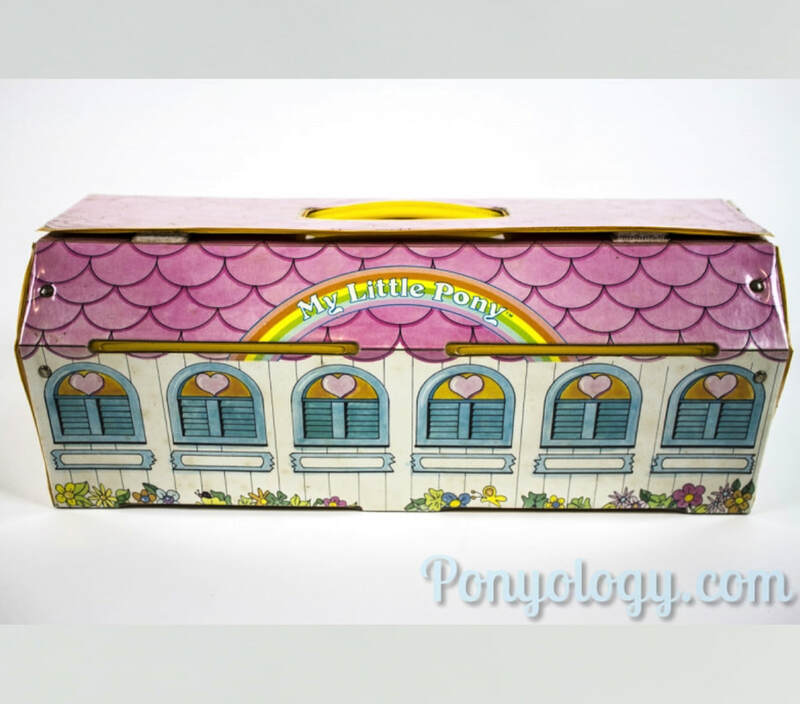 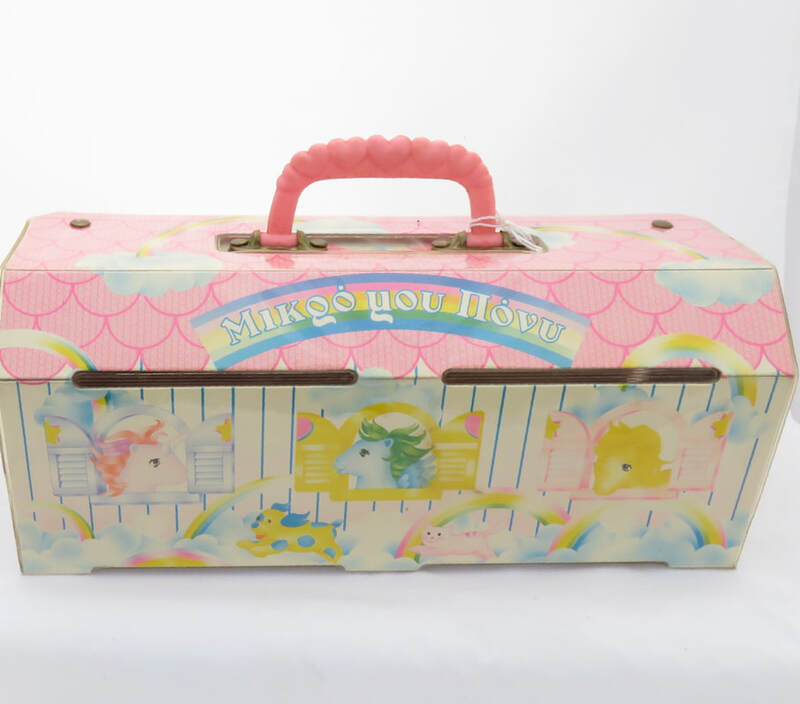 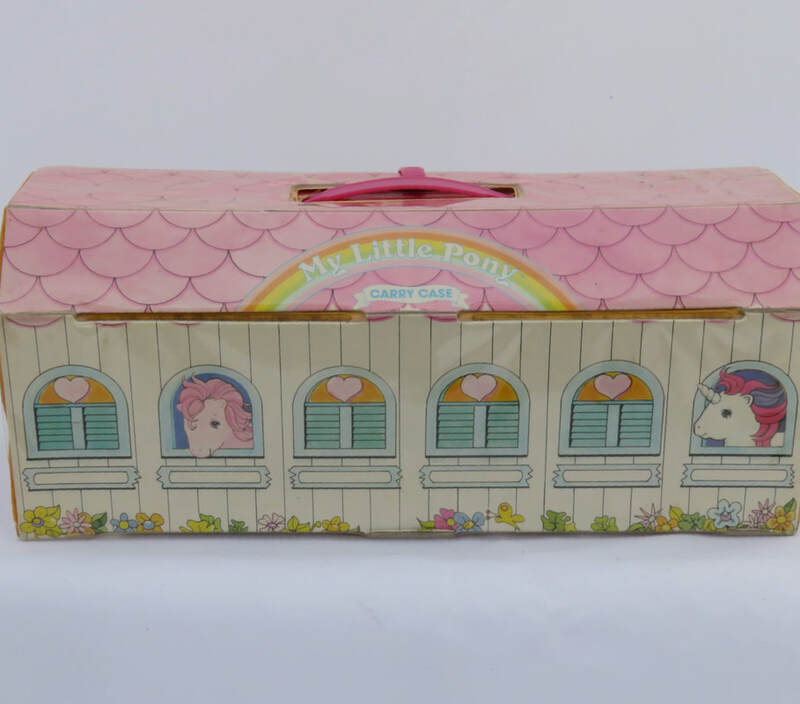 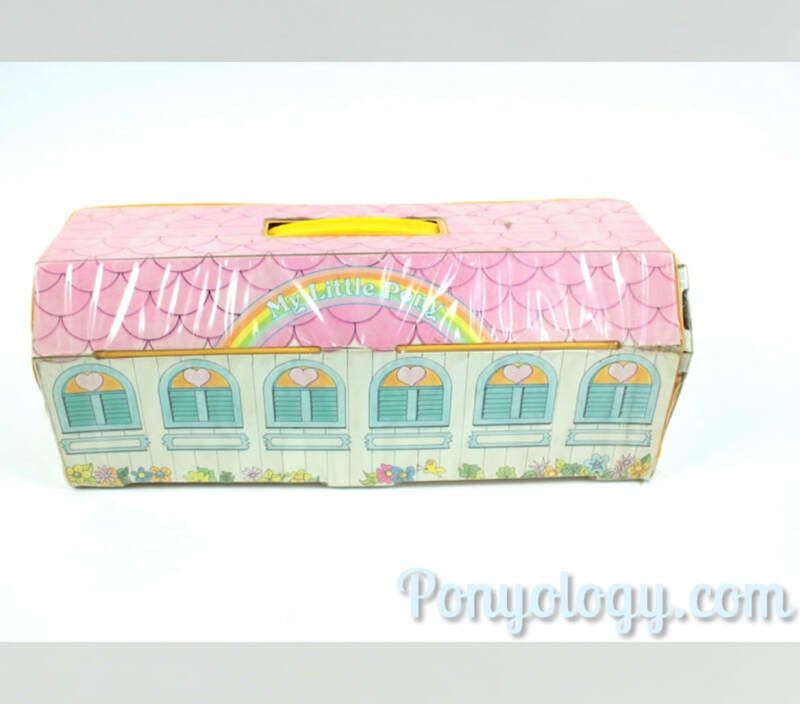 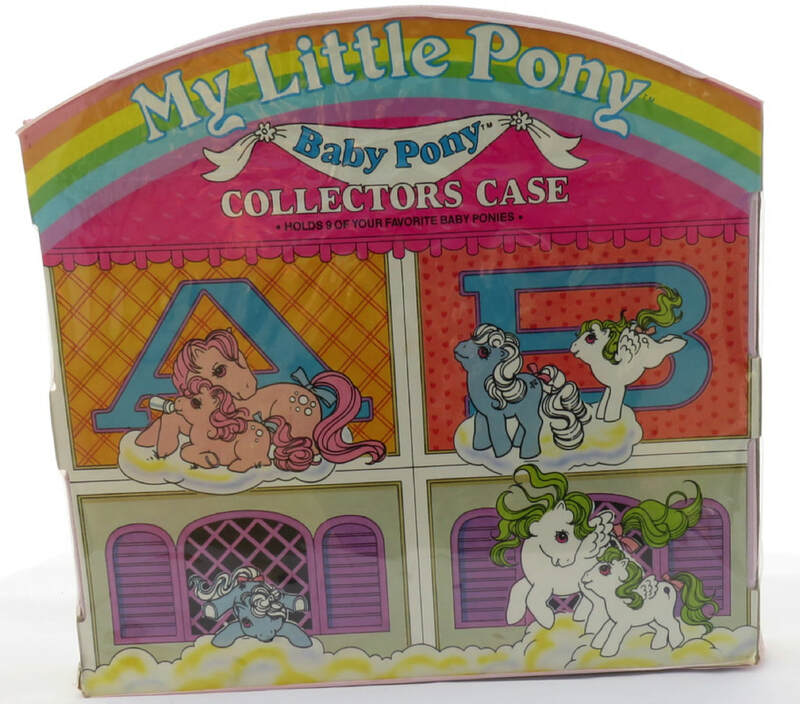 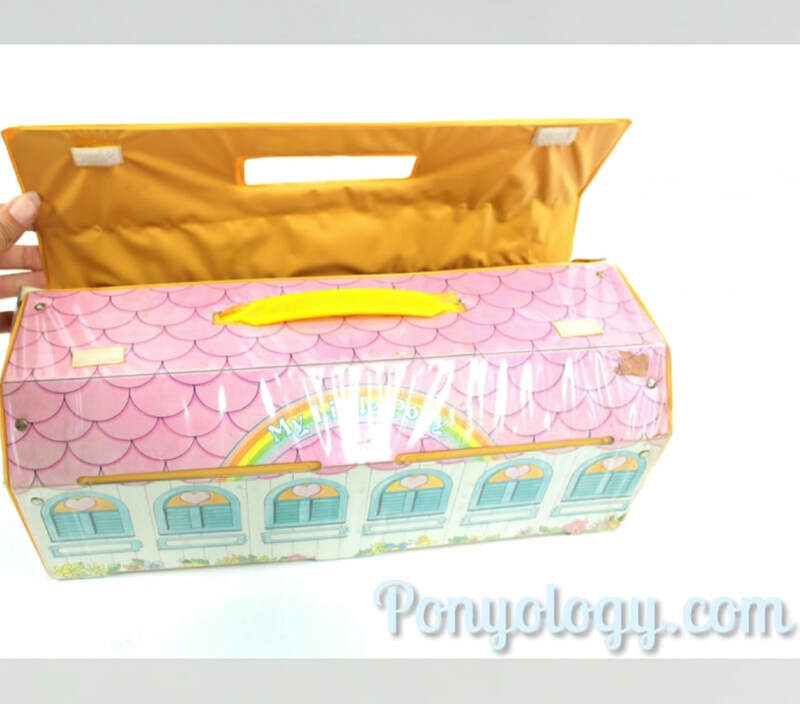 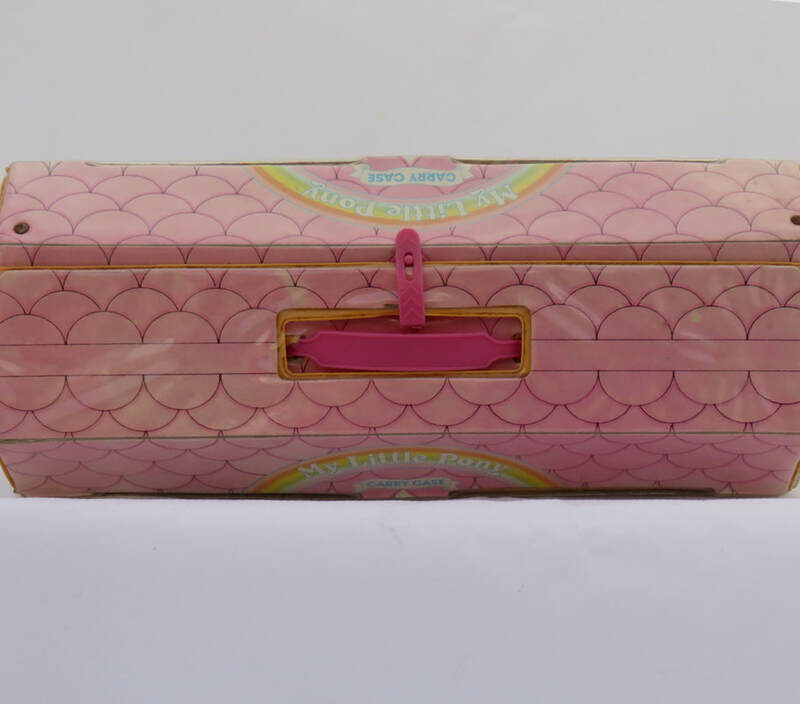 Baby Pony Collectors Case "Holds 9 of Your Favourite Baby Ponies"
It's styled like the Lullaby Nursery with images of the windows and alphabet letters. 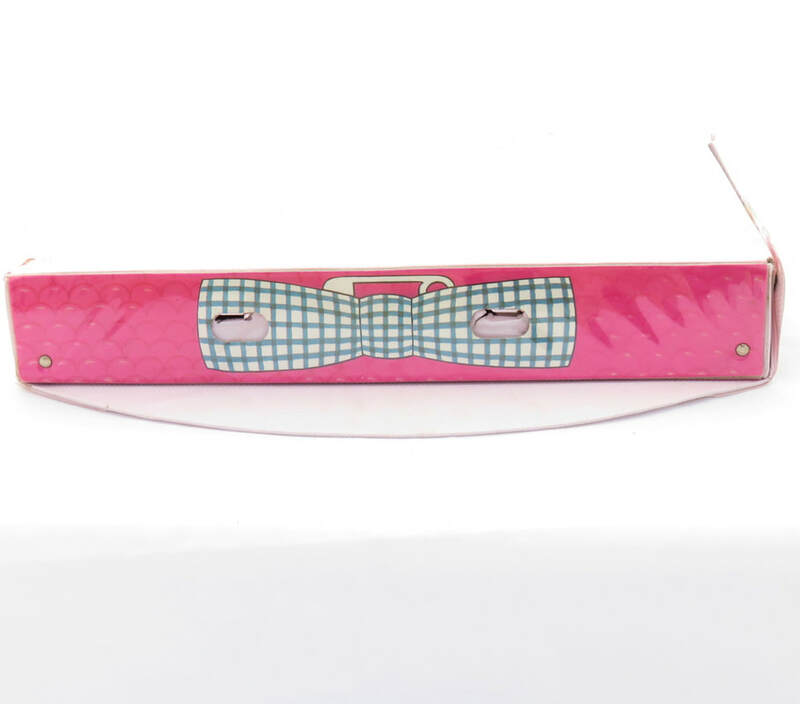 It also has a representation of the blue gingham bow on the roof. 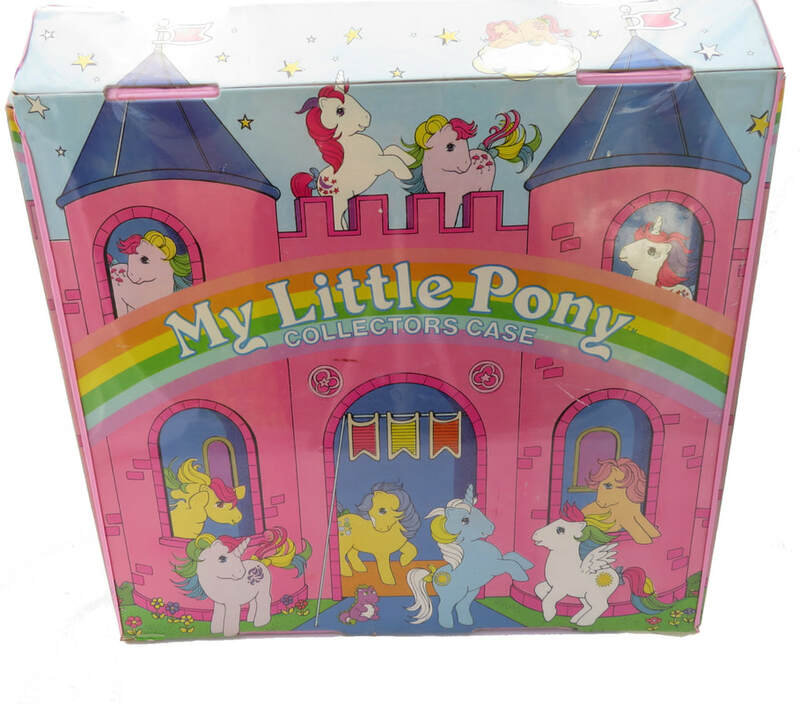 Similar to the second edition one but doesn't have ponies at the windows on the front or back. 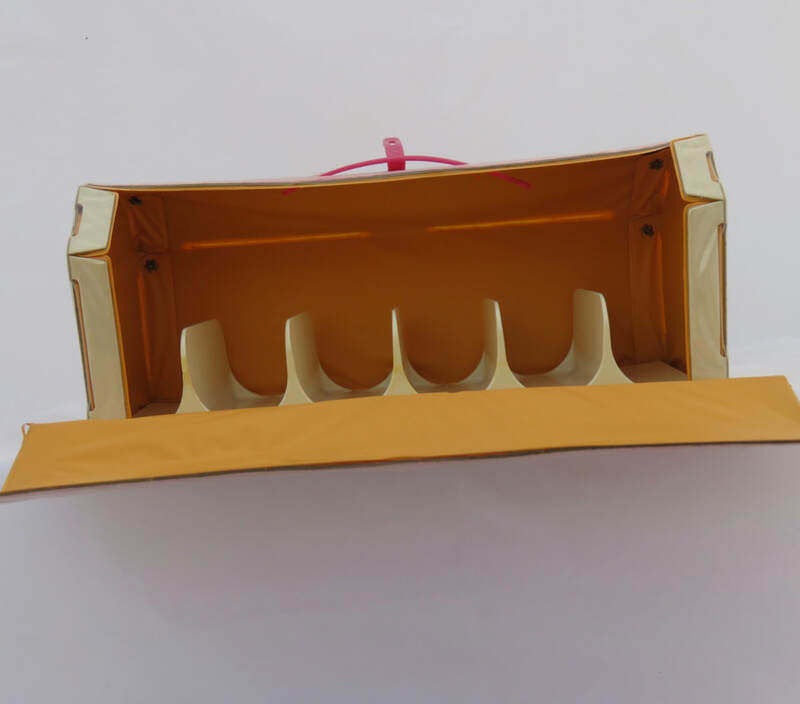 It also has a yellow handle and is fastened with Velcro on either side at the top. 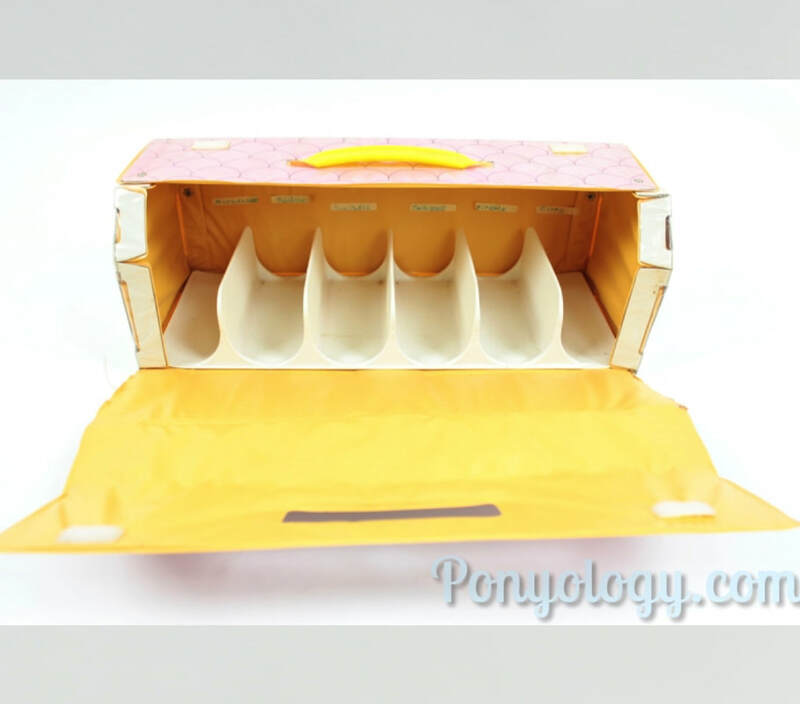 This case is made from a cardboard covered in clear plastic on the outside and yellow plastic inside. 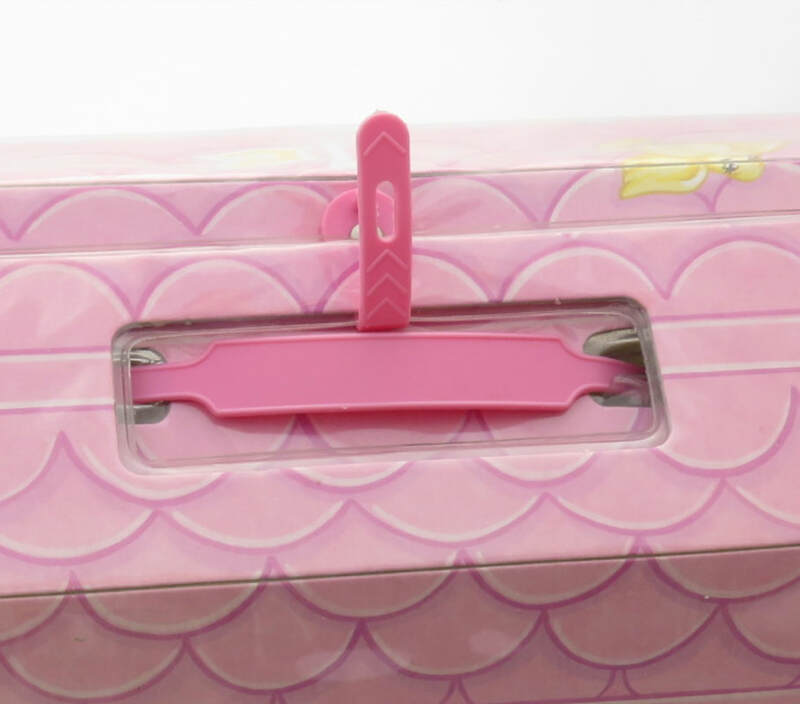 The clasp is a simple plastic push fitting. 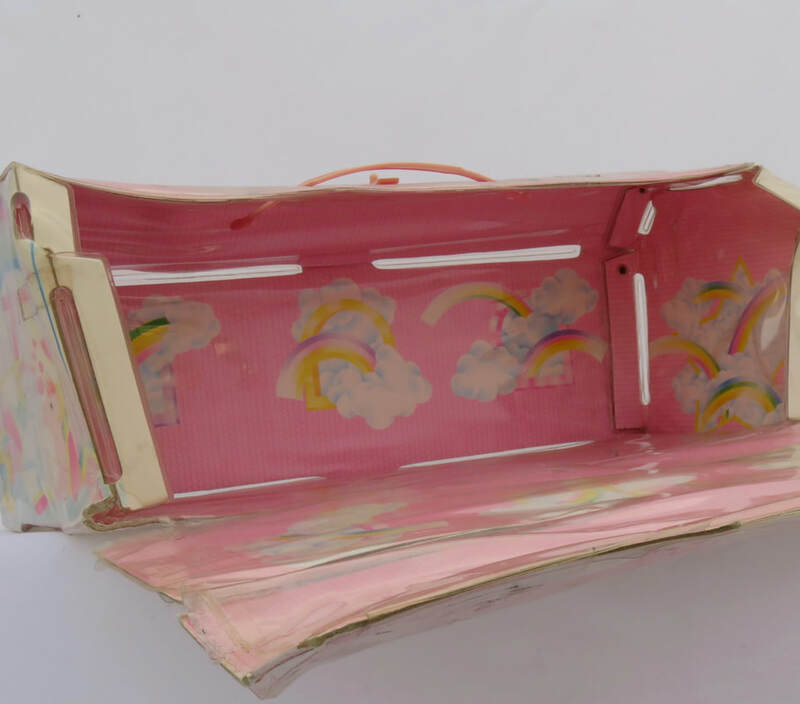 The plastic loops over a section of roof and secures back on itself. 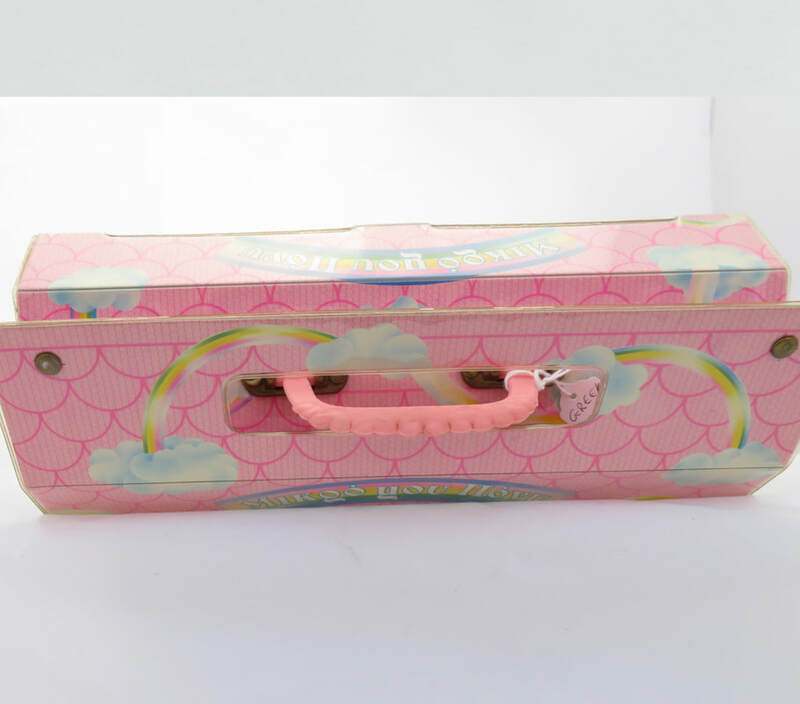 Then the handle fits through the hole. 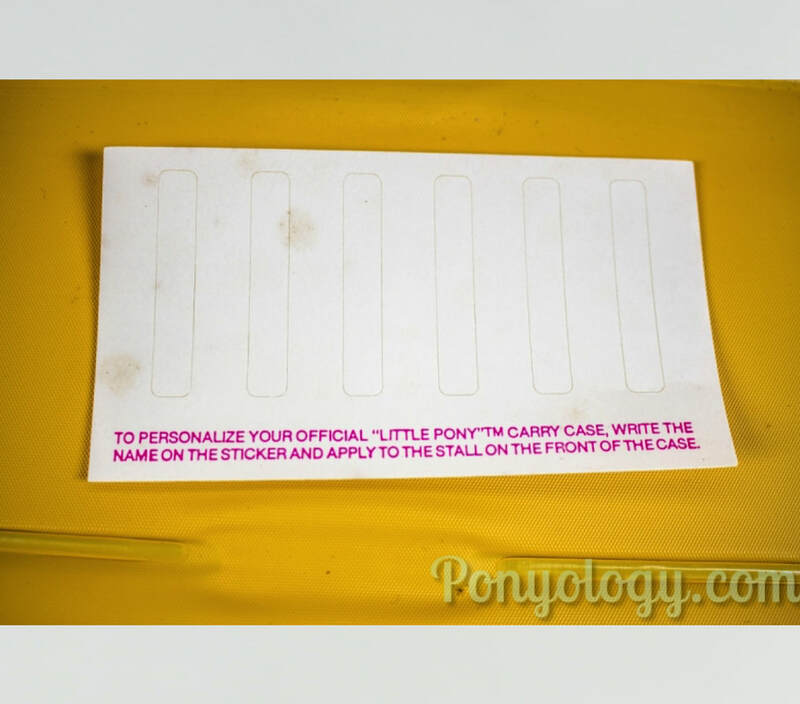 It comes with a piece of thin shaped plastic to provide the ponies with stalls to stand in. 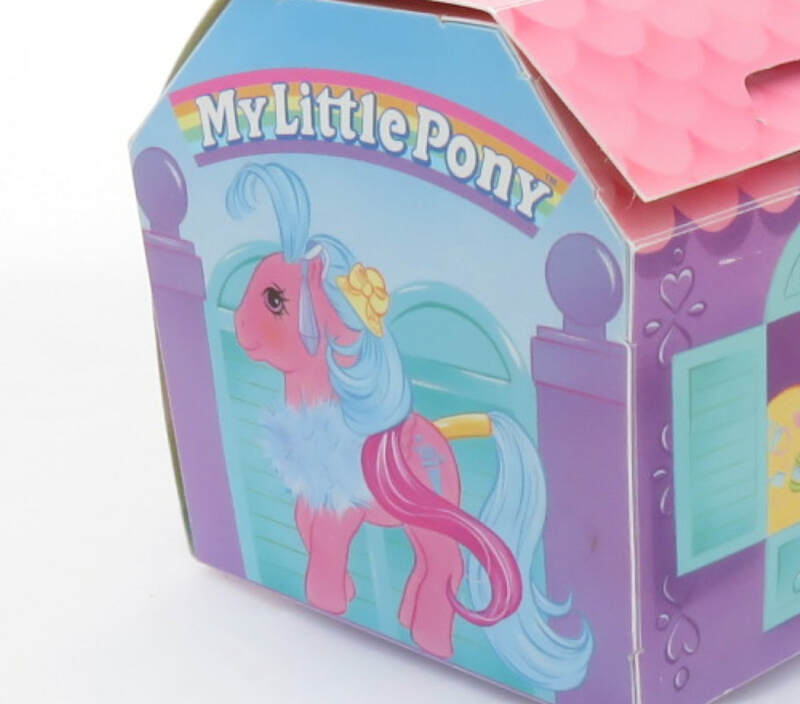 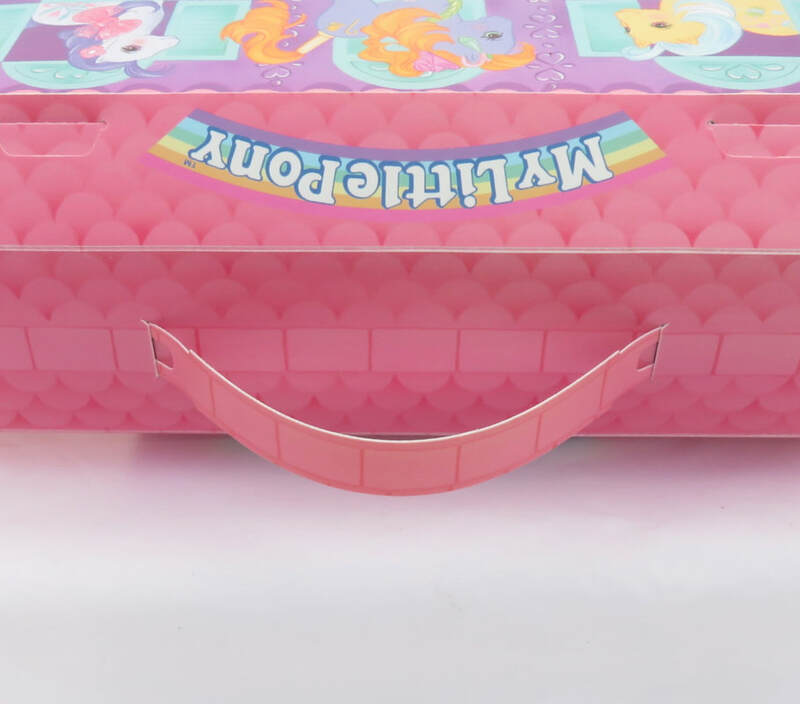 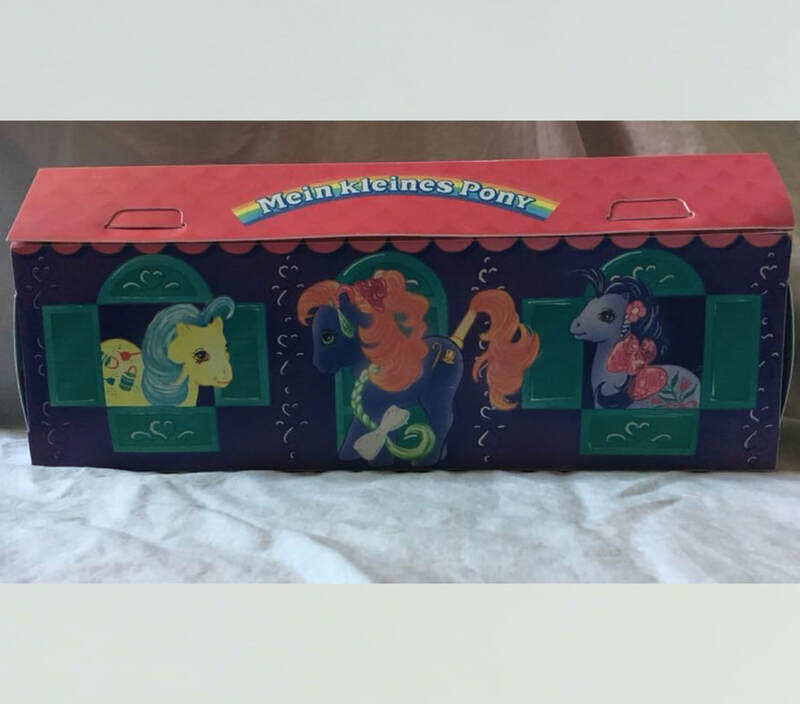 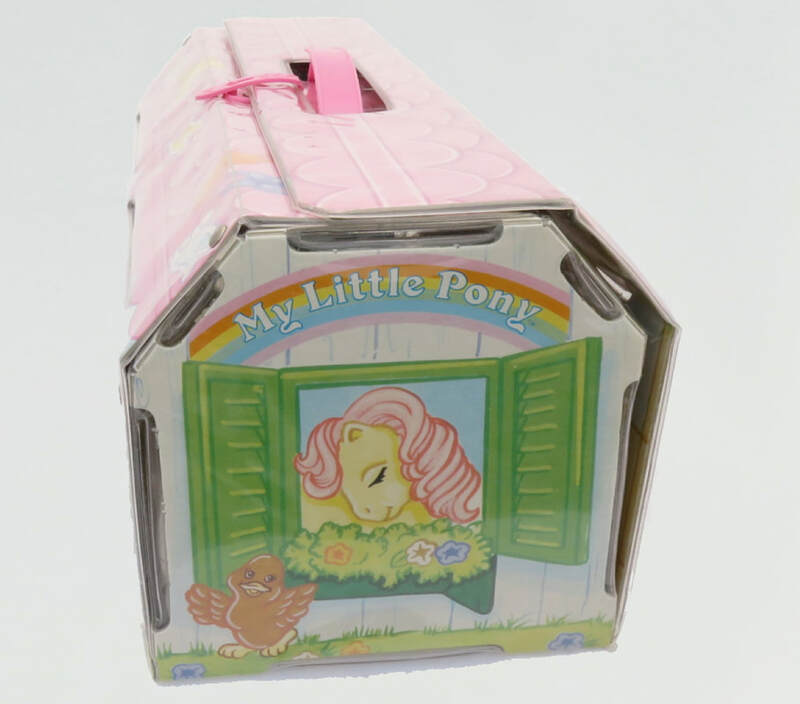 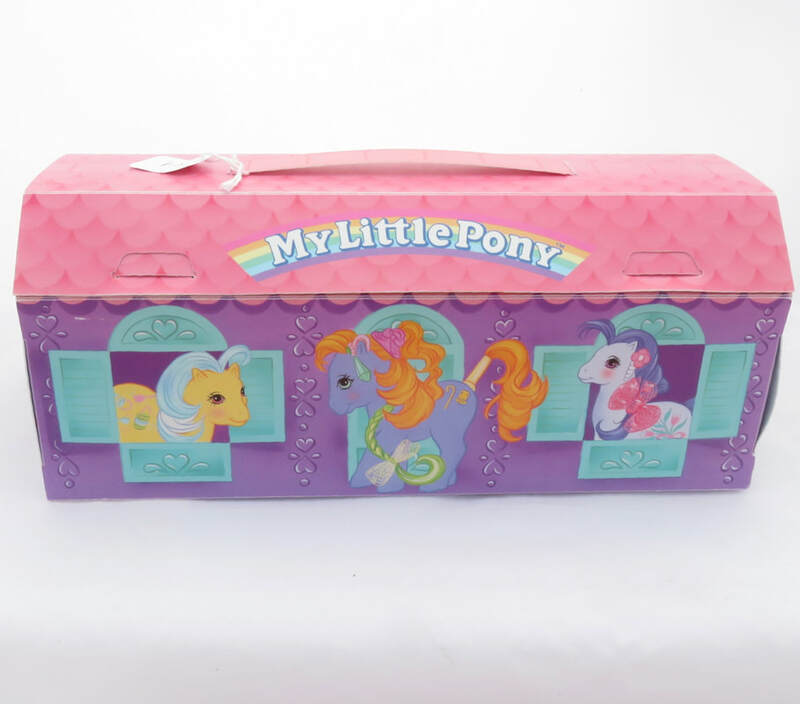 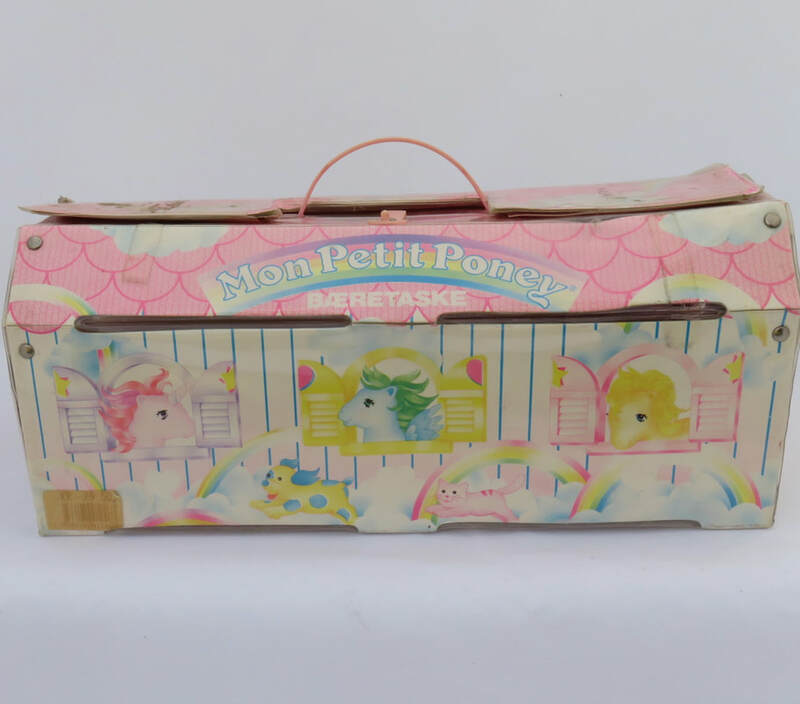 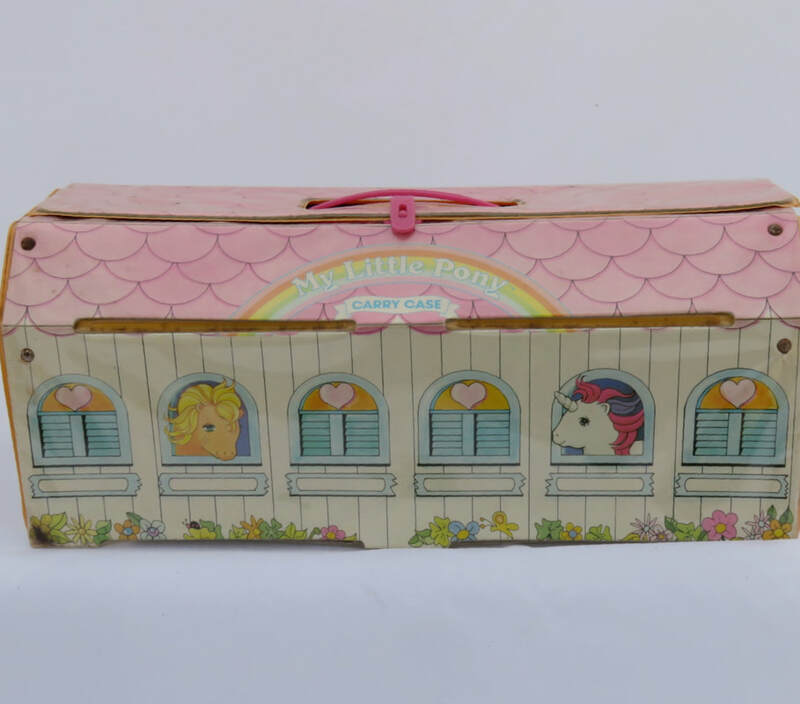 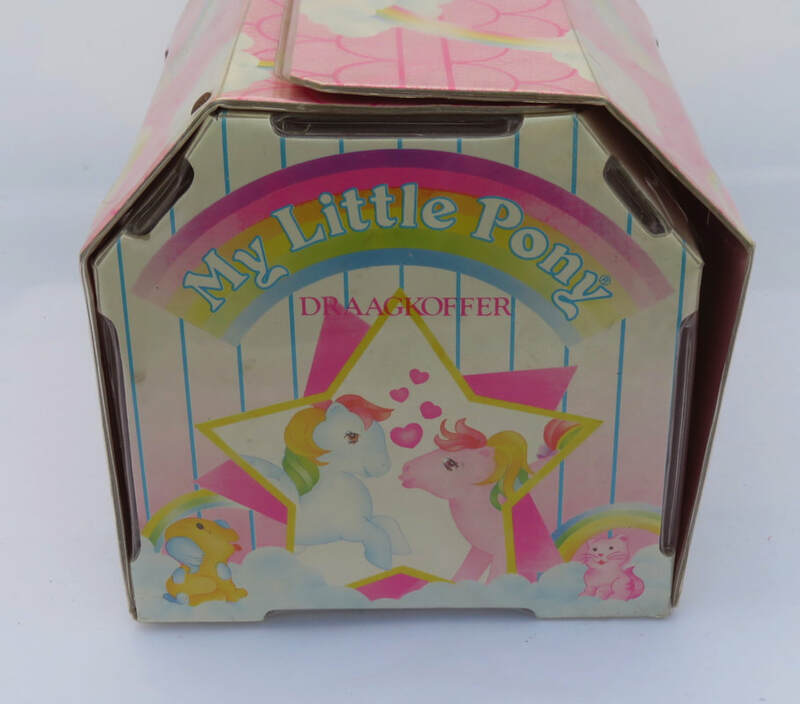 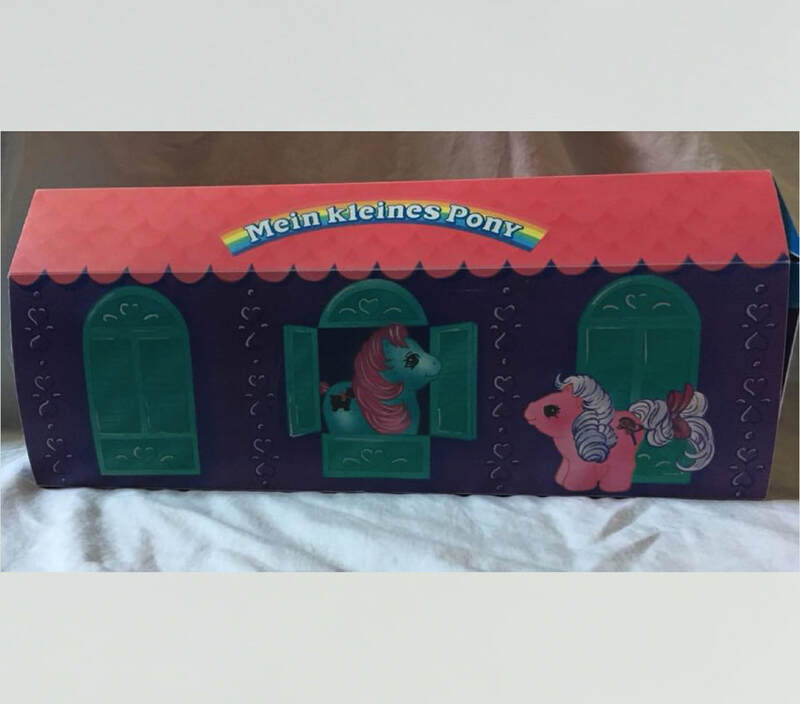 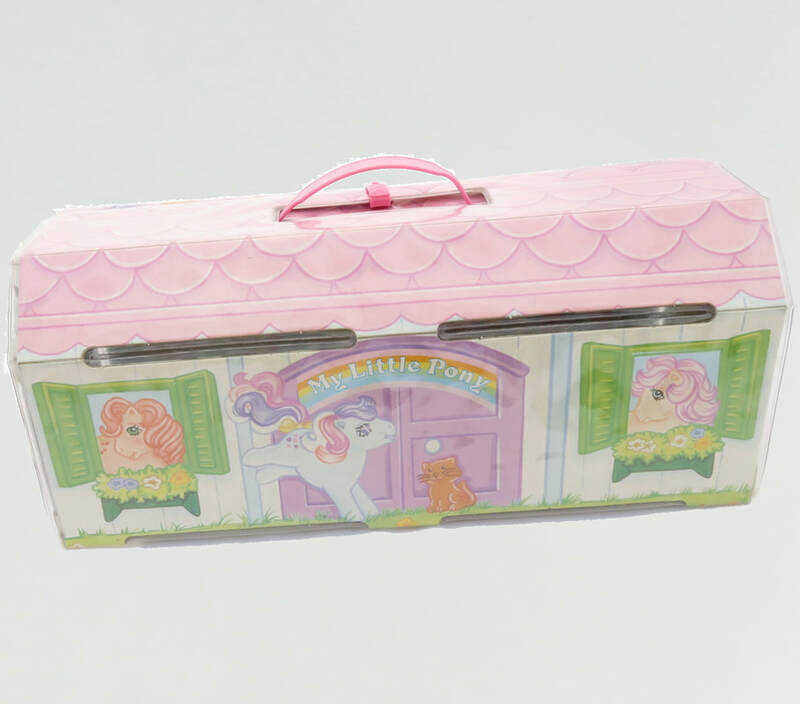 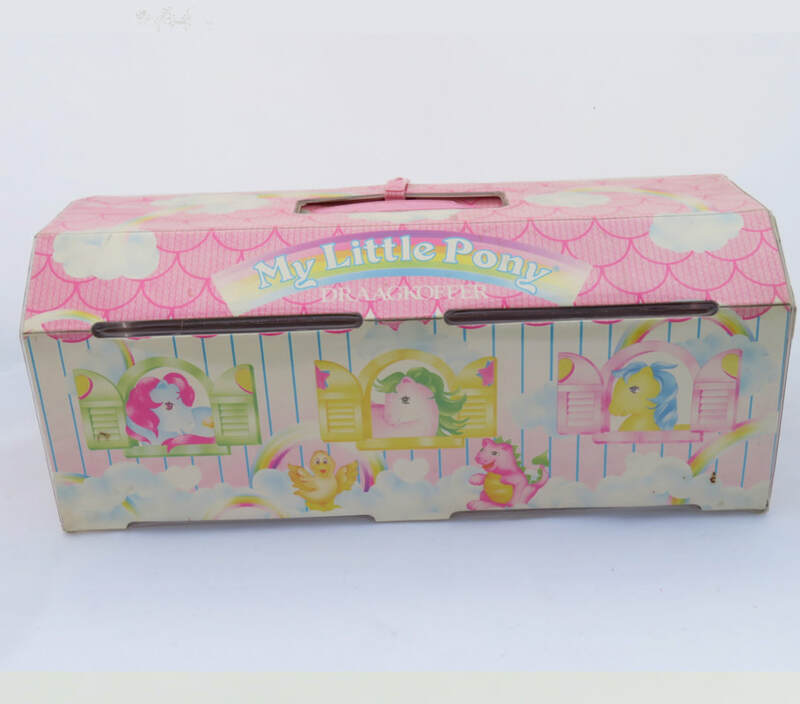 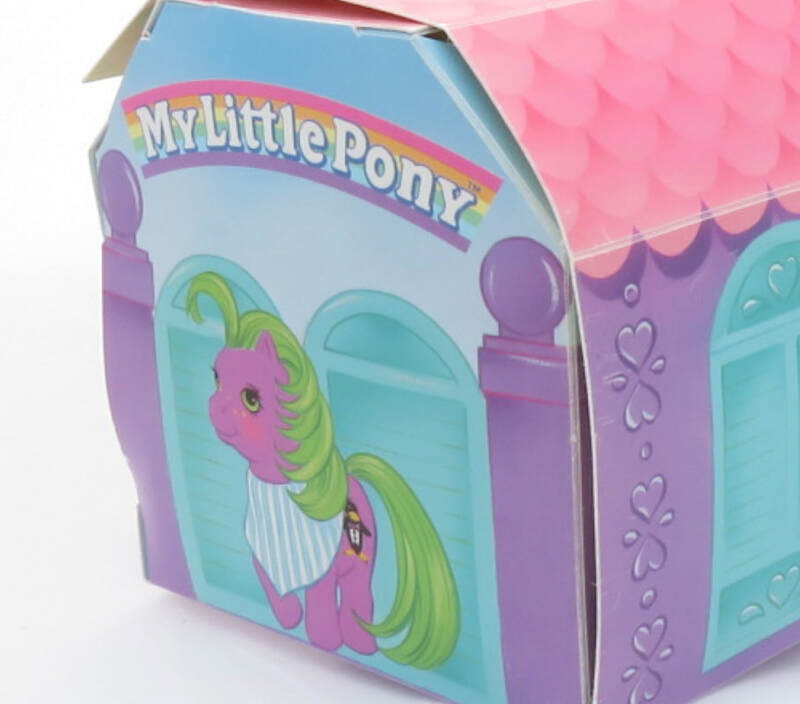 This version also came with name stickers so each pony could have it's own dedicated stall with space inside or under the image of a window on the front. 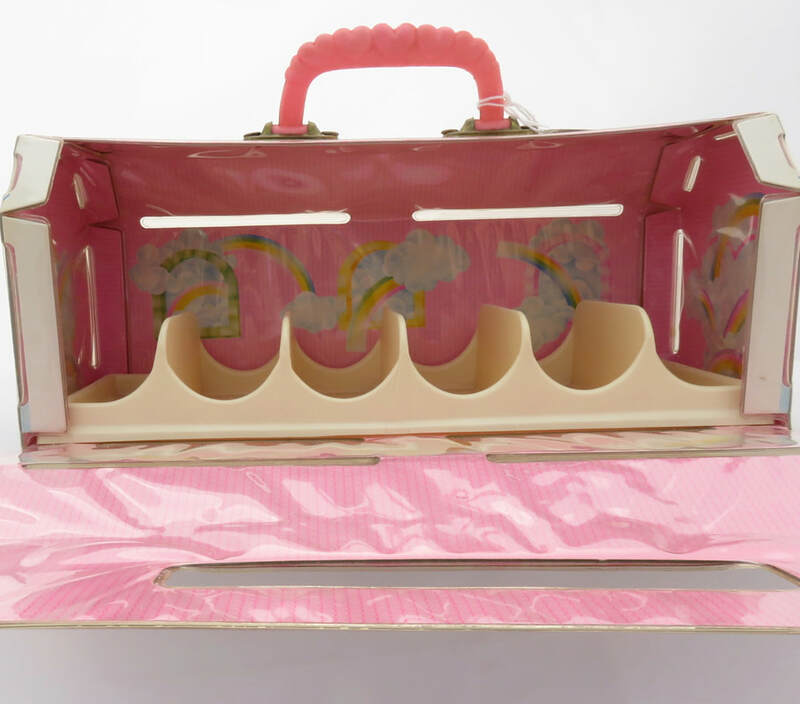 This Carry Case was the first issue in the UK. 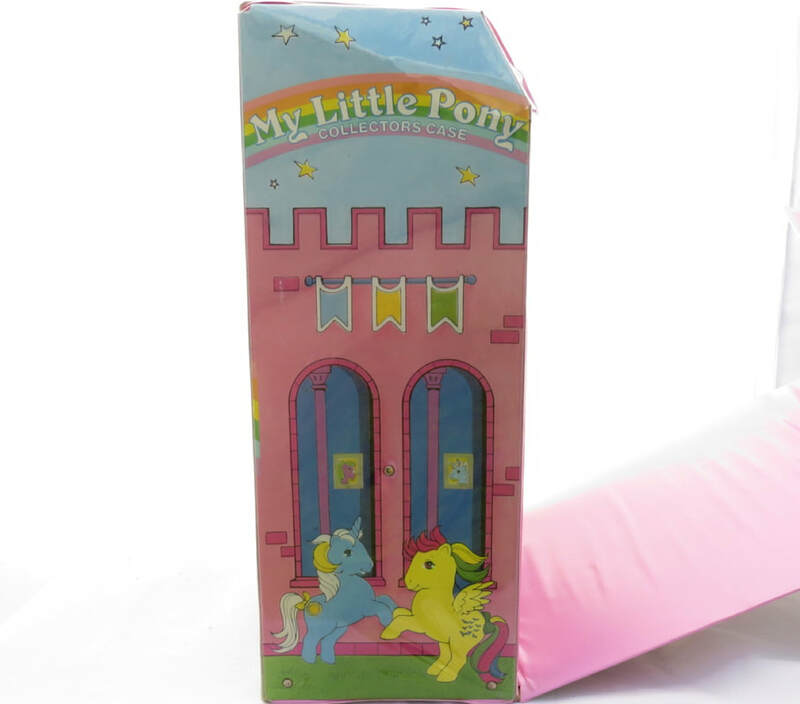 It was available through mail order. 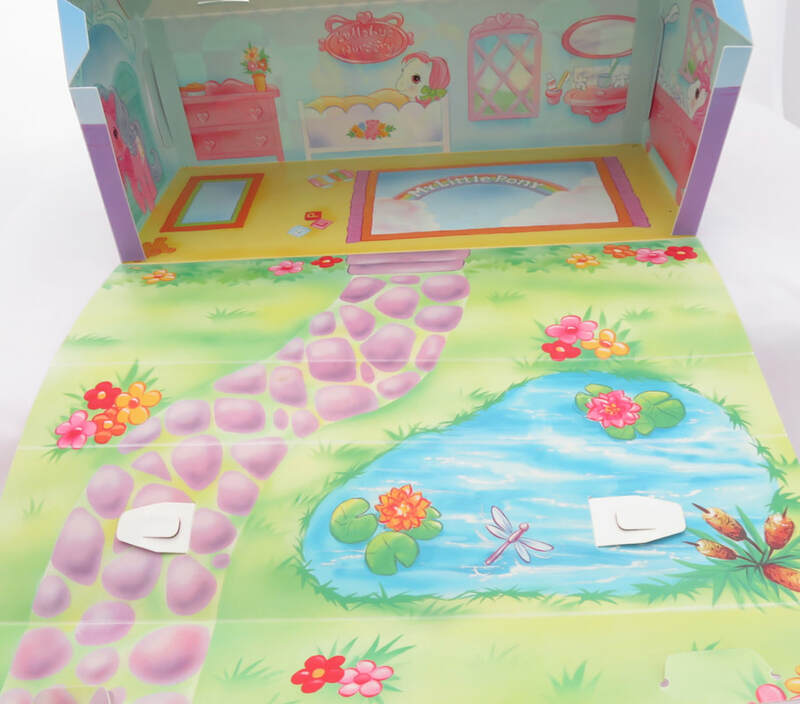 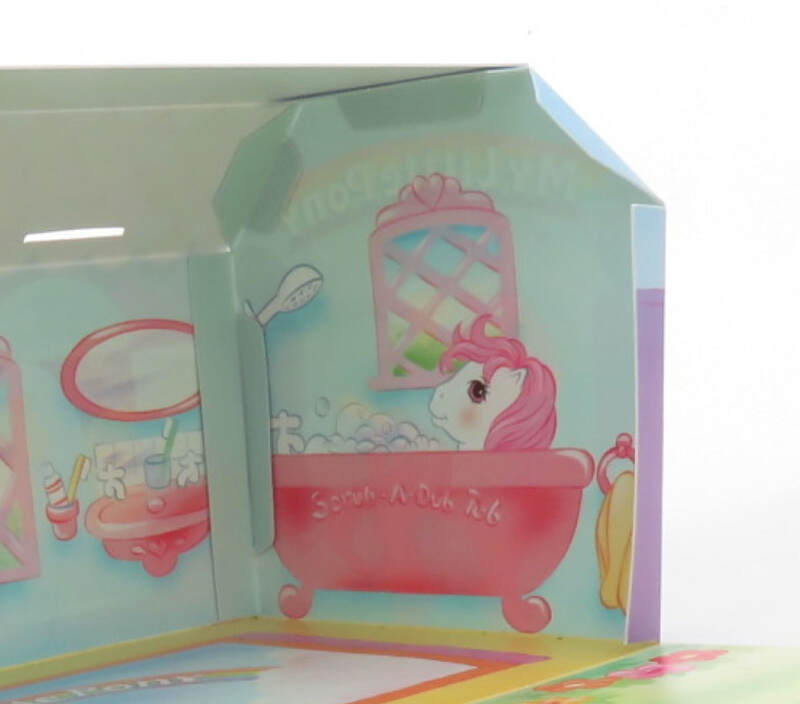 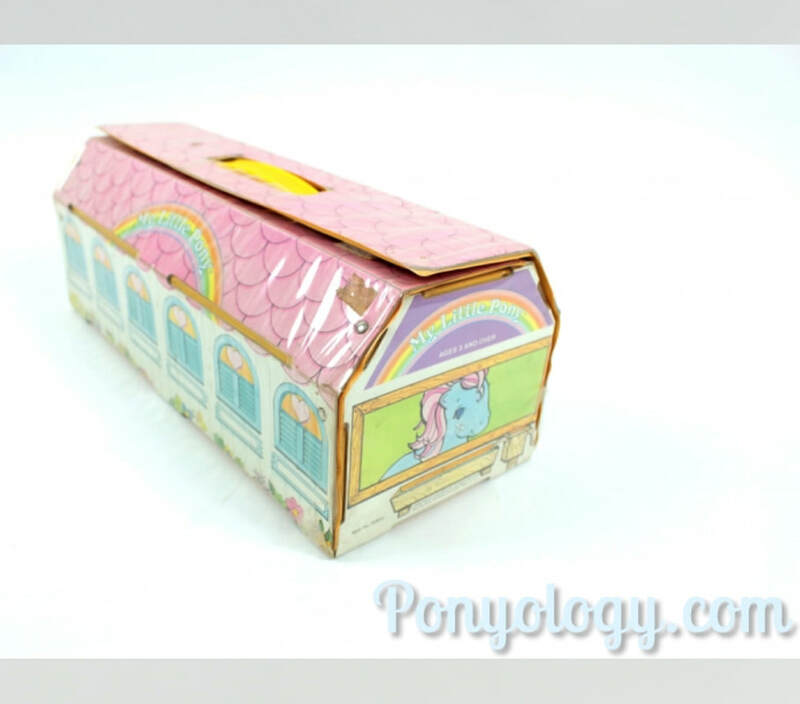 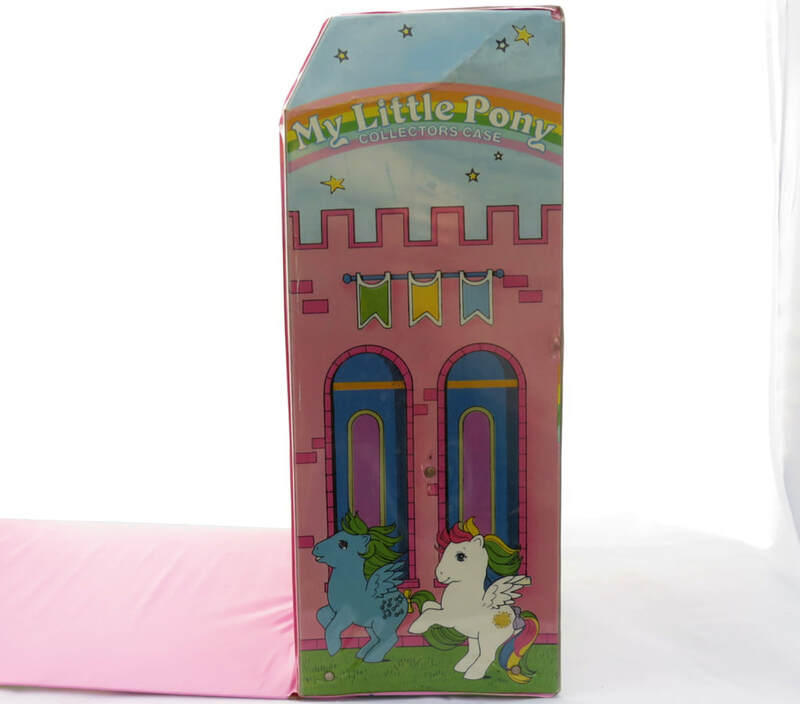 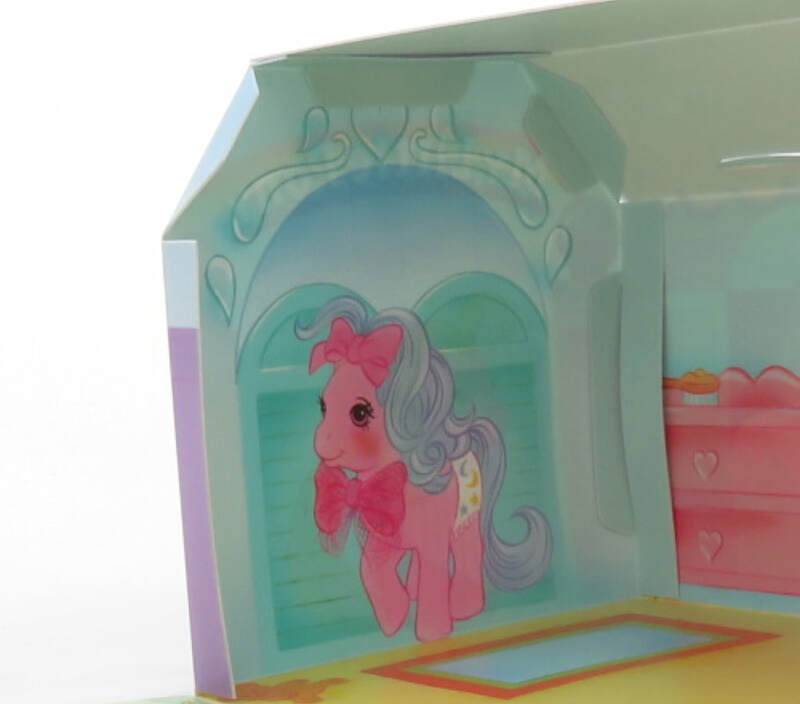 It's composed of cardboard encased in plastic and originally came with plastic stalls that gave spaces for 6 ponies. 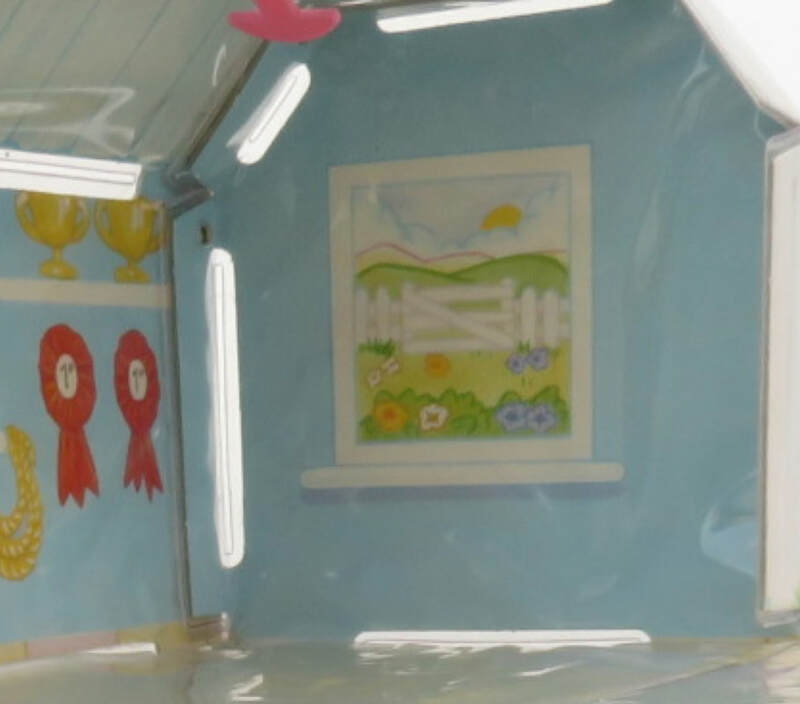 There's a scene of a Tack Room with windows looking out onto countryside on the inside. 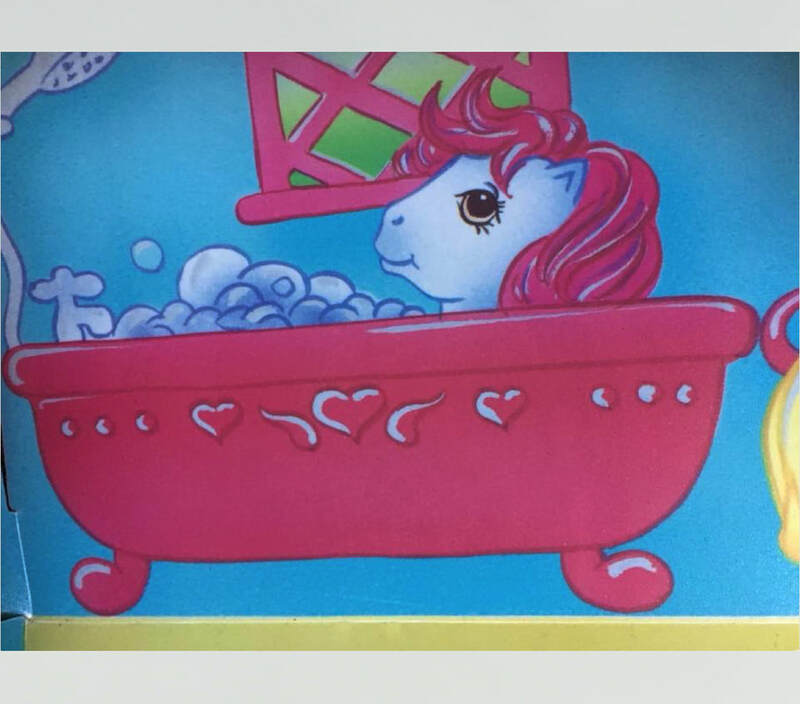 ​(US name Sweet Stuff), Twinkles the Cat and possibly Lemon Drop. 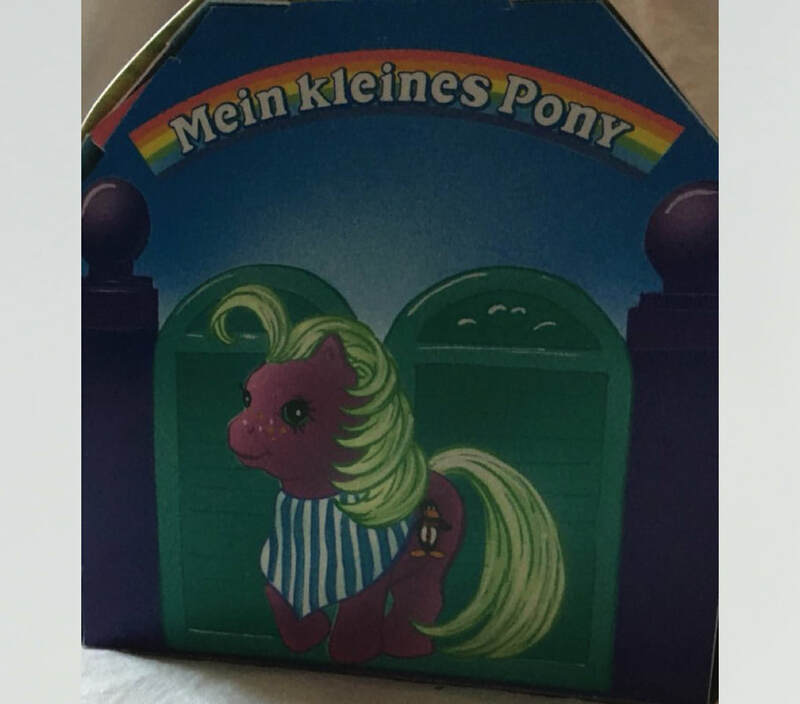 There is also a version of this case with the title in German. 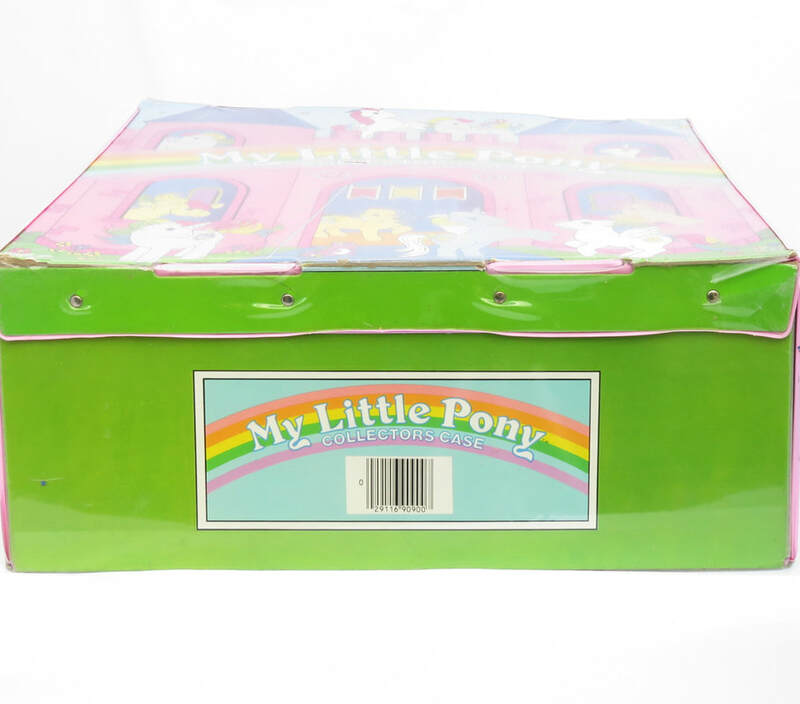 The Second issue comes in a new material and brighter colours. 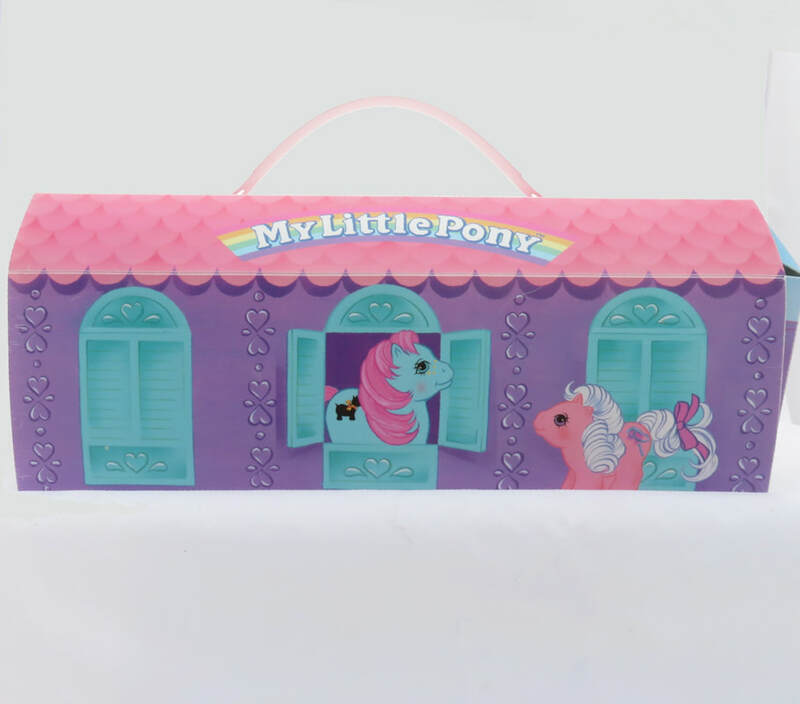 This Case is made of a strong, thin, fairly rigid plastic. 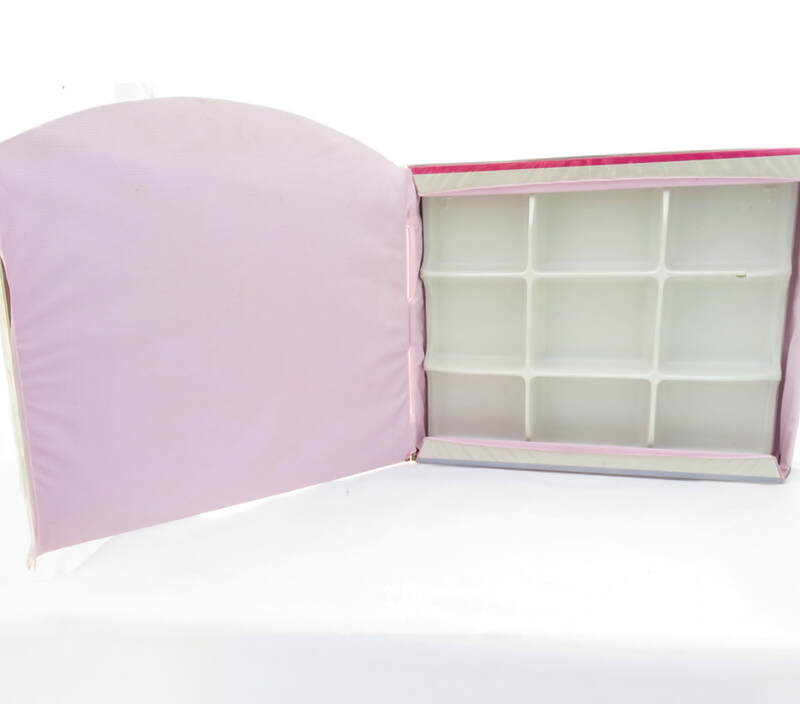 Unlike other cases this one is fastened by two tabs which go into slots on the roof. 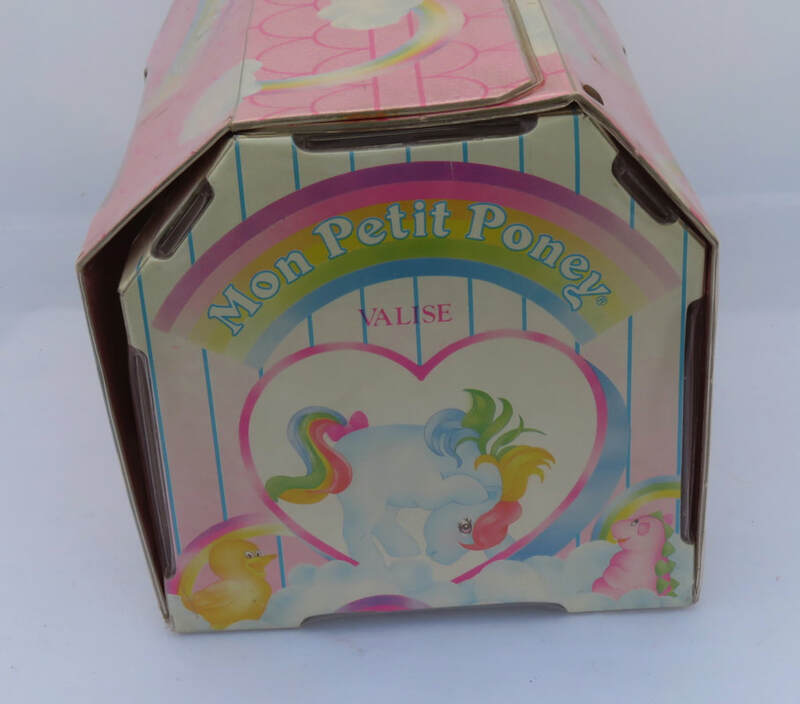 It has a slightly rough surface with a strange texture. 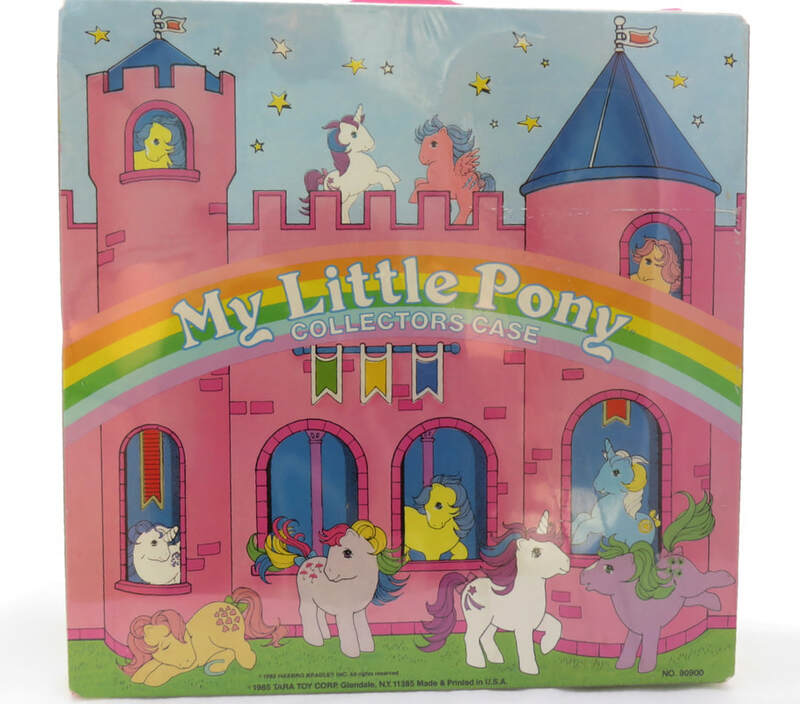 Like the other UK Case it is decorated with a scene on the inside and originally came with a plastic insert to provide six stalls. 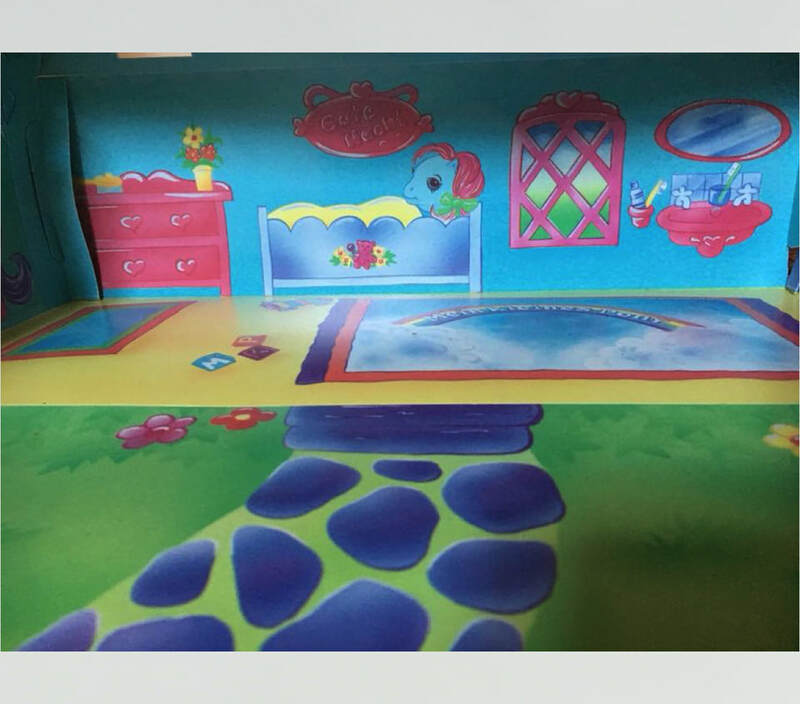 Back - Sand Digger, Tap Dancer and Flower Burst. 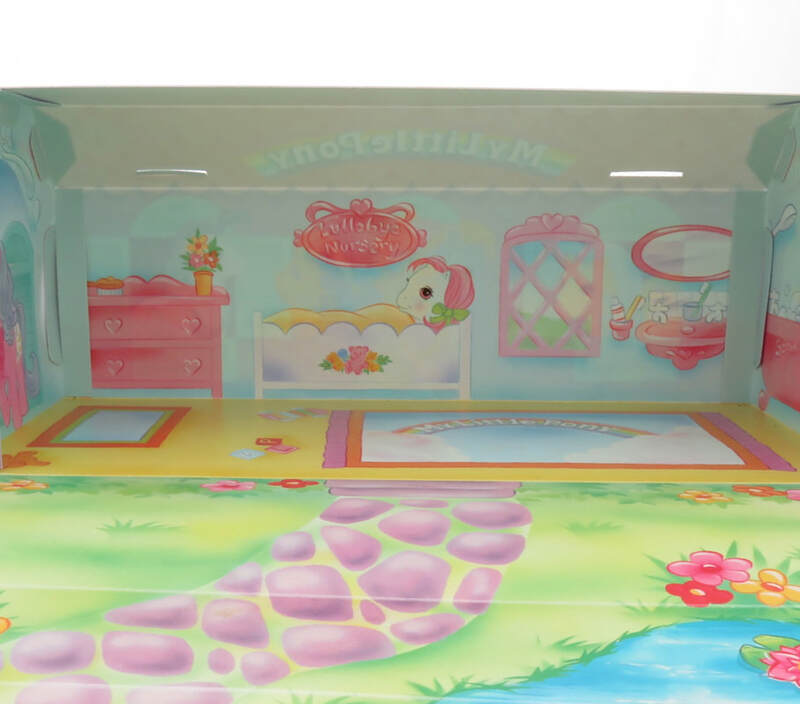 Inside Left - baby Starburst. 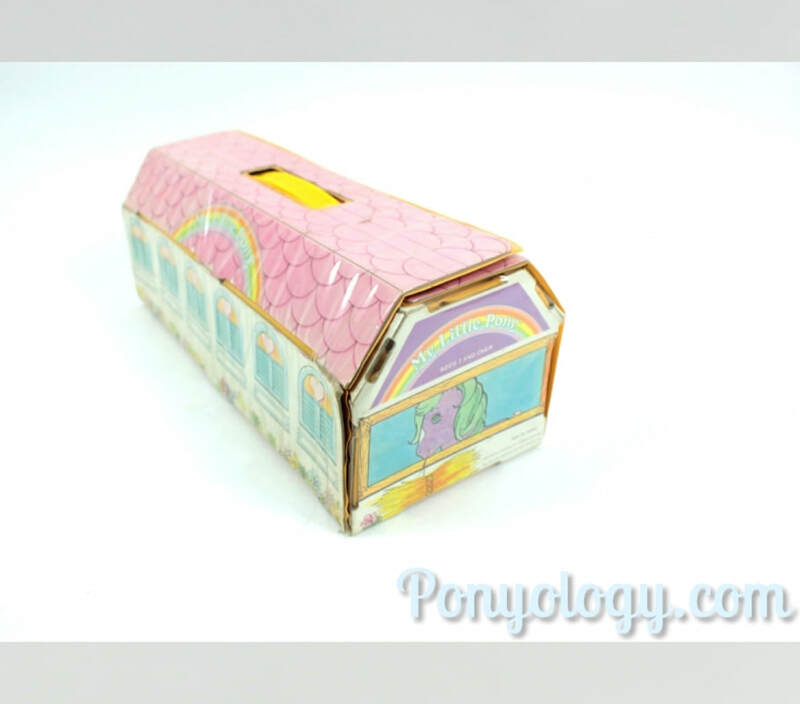 It shares the same design as the Dutch and Greek Cases. 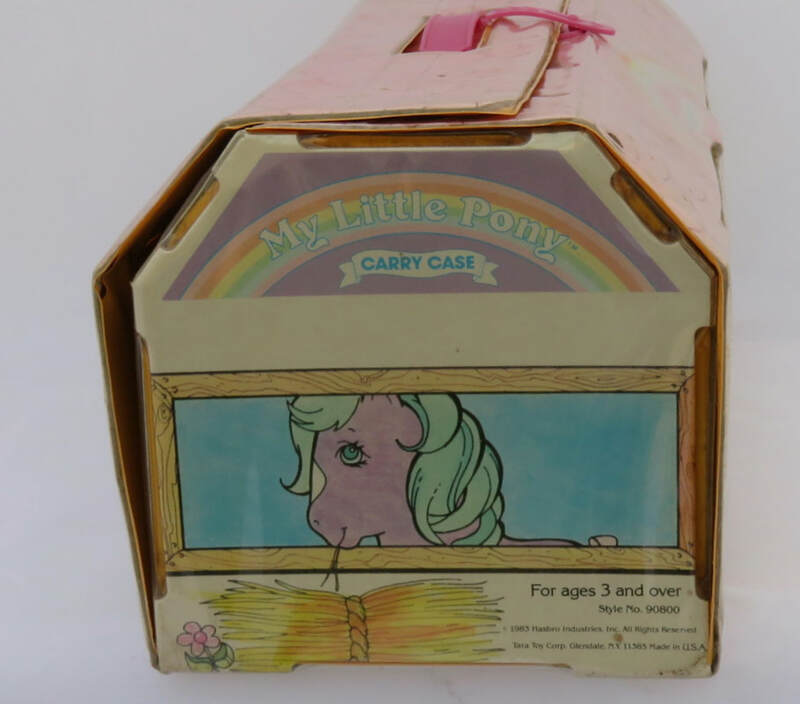 Mine are a little beaten up but are made in the same way as the First UK edition Case. 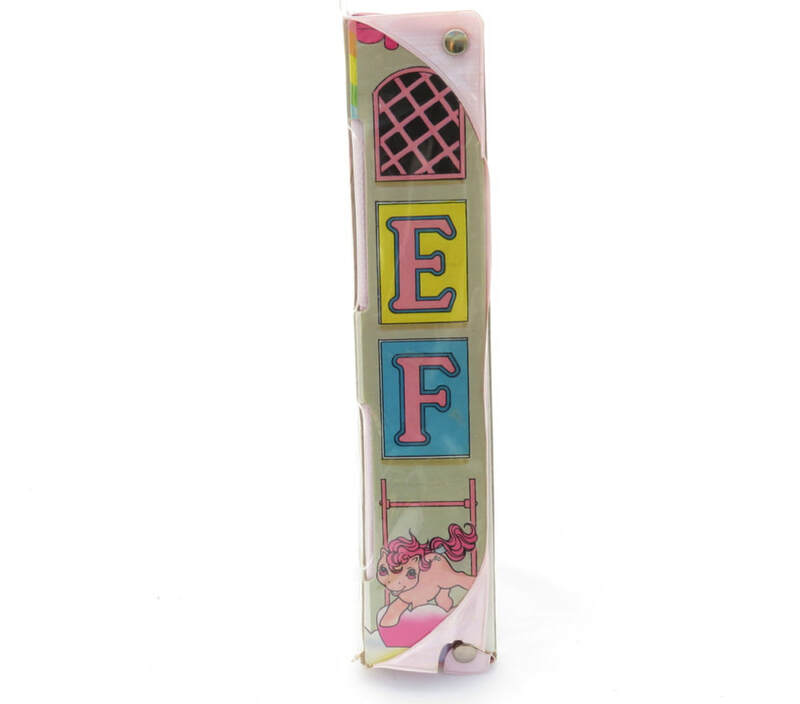 The clasp has been broken off but it appears to be the same. 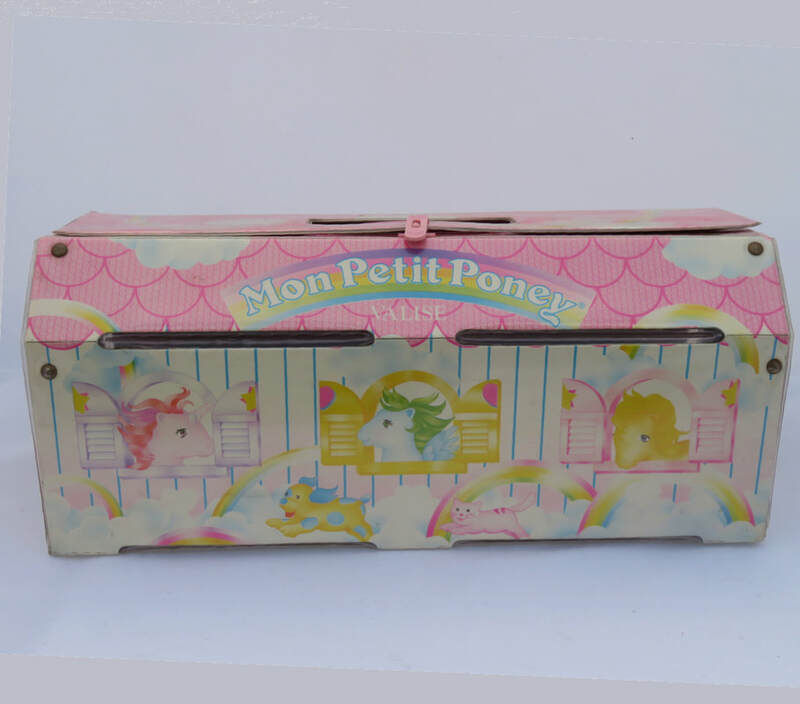 I have one with a white handle which may be a replacement. 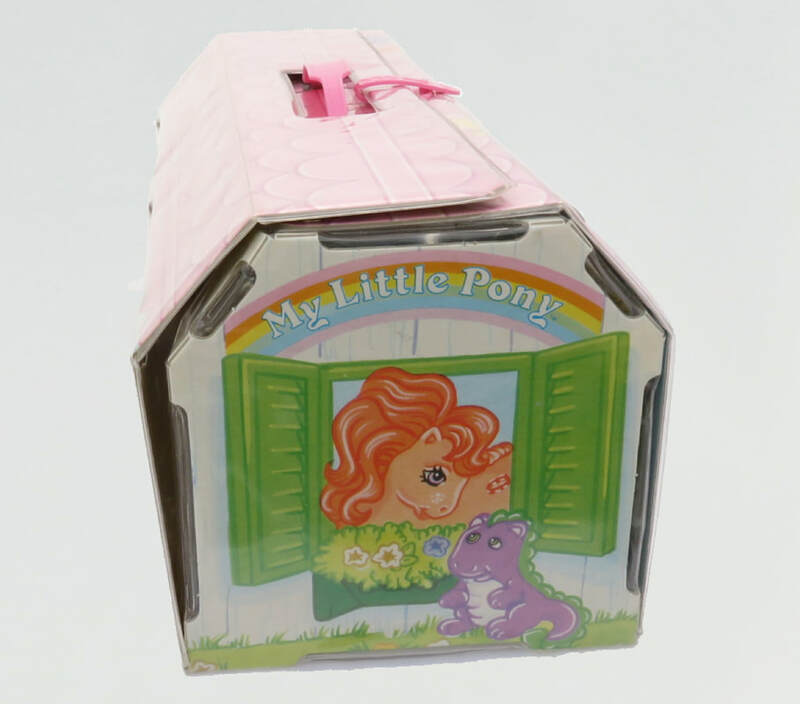 My guess would be it came with plastic stalls like all the others. 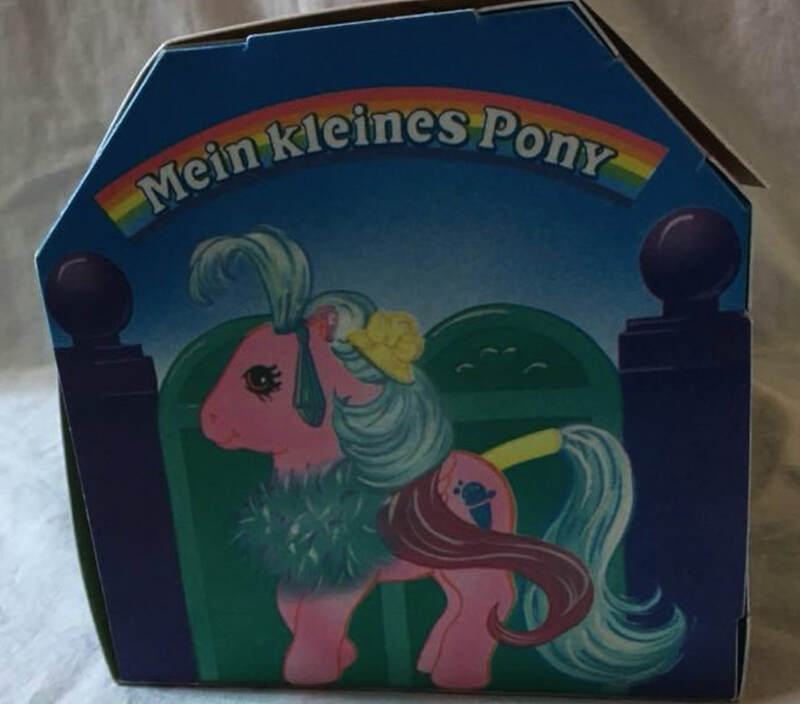 A label on the back reads: KR. 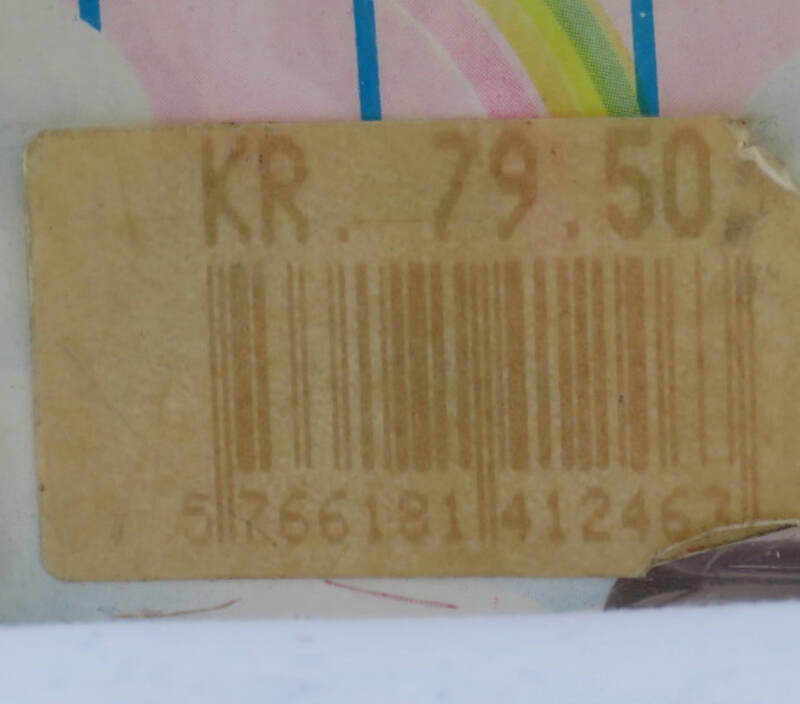 79,50. 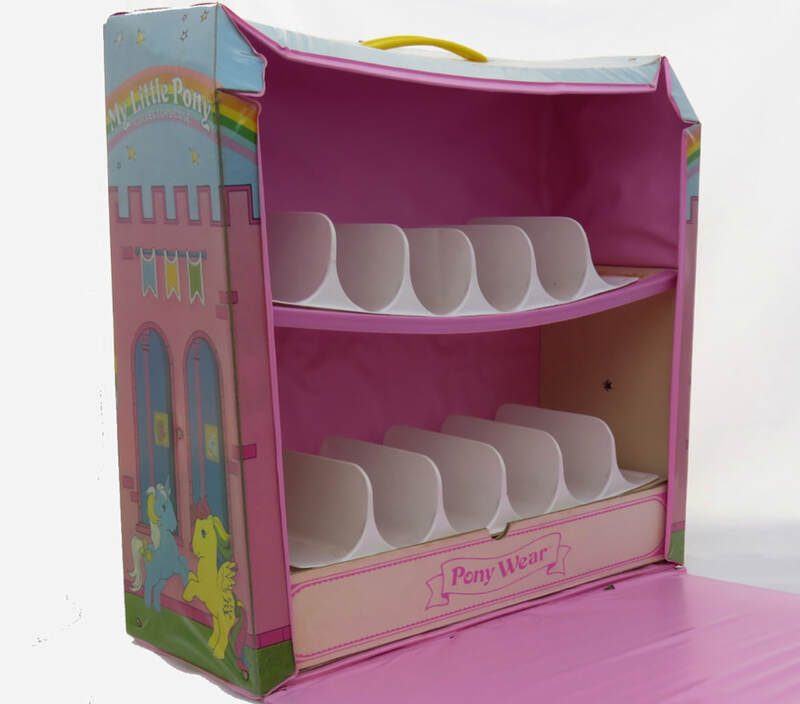 The design is the same as the Danish and Greek Cases but the front and back and right and left have been switched. 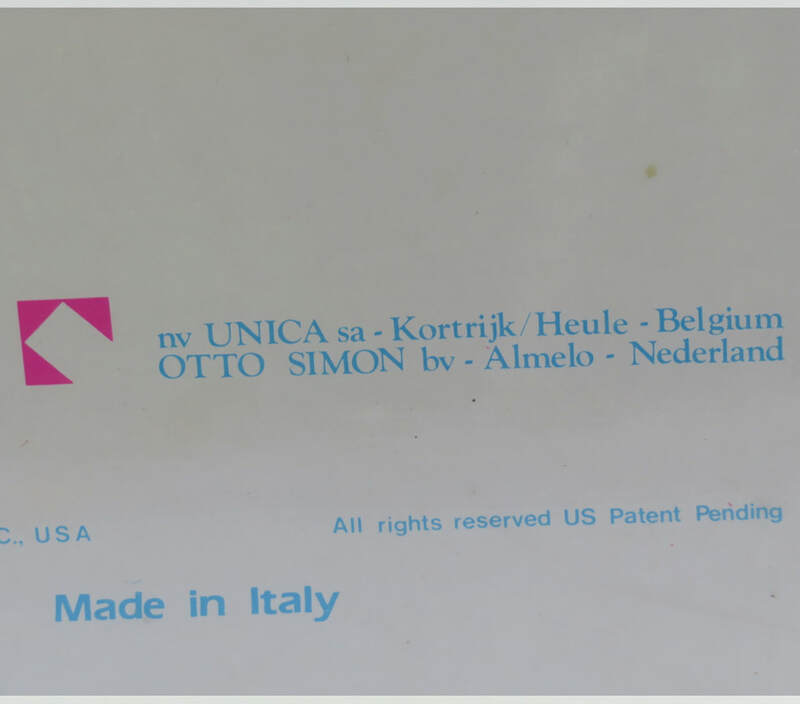 Bottom - Made in Italy for the Belgium, Netherland Market. 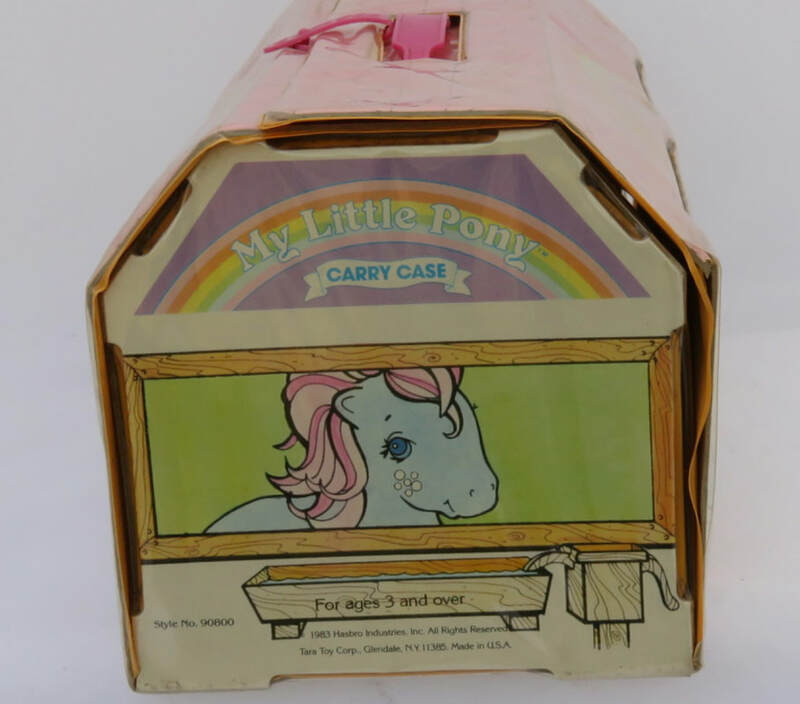 Same as the UK second edition Carry Case. 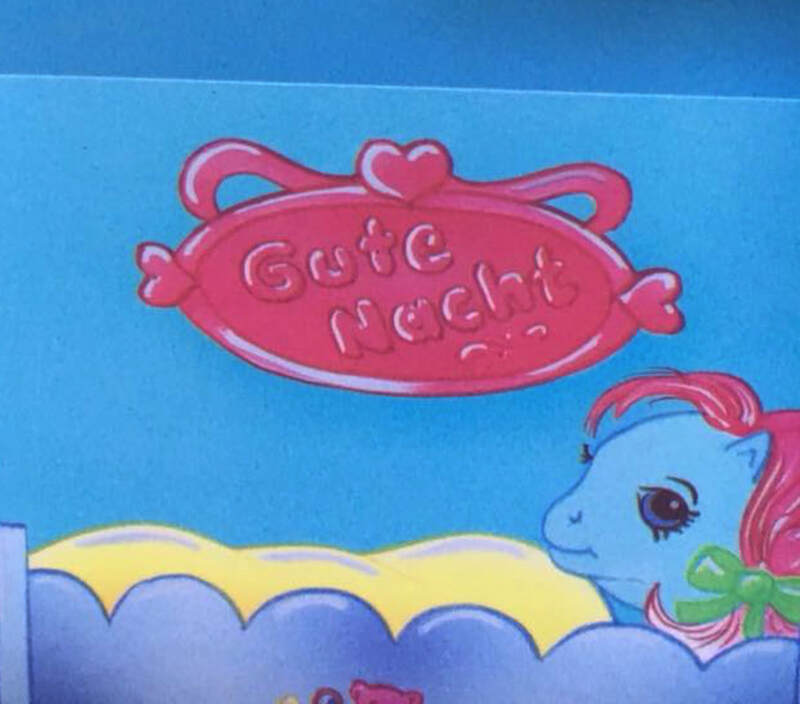 ​The writing on the wall inside is in German and says "Good Night"
This has the same pony design as the Danish case. 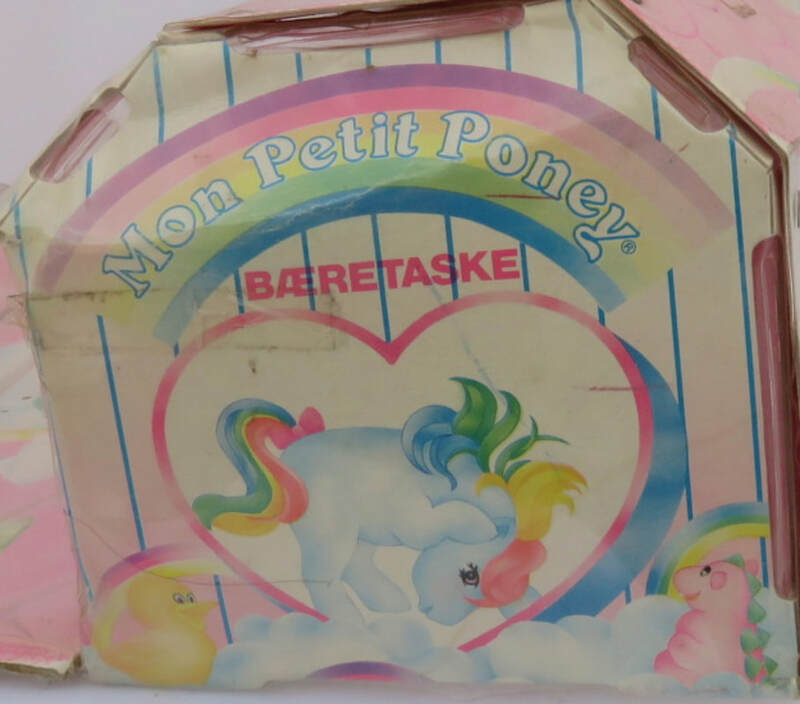 It's made the same way as most other cases with cardboard covered in plastic. 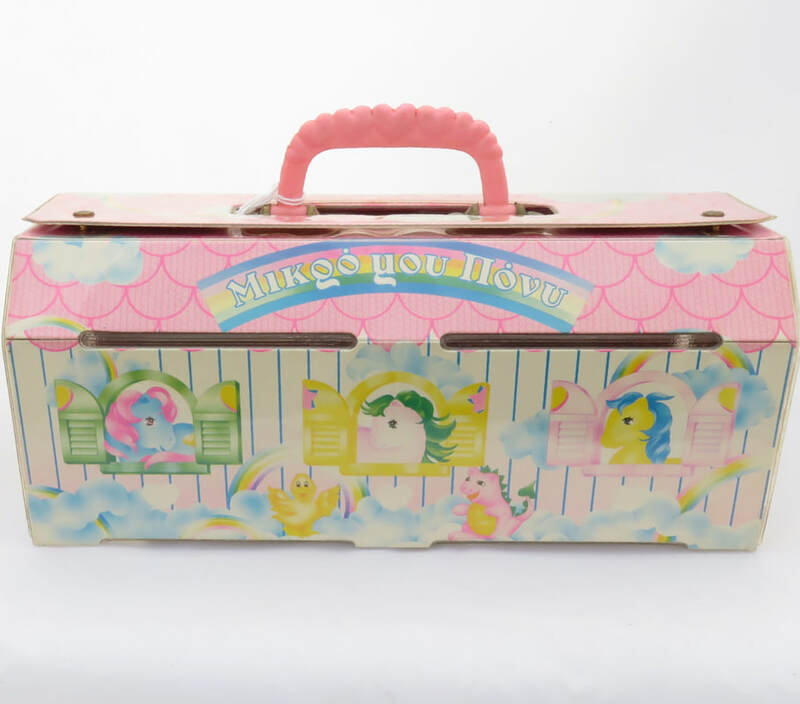 However, it is the only case I've seen which has a solid plastic handle and secures with two push studs at the top. 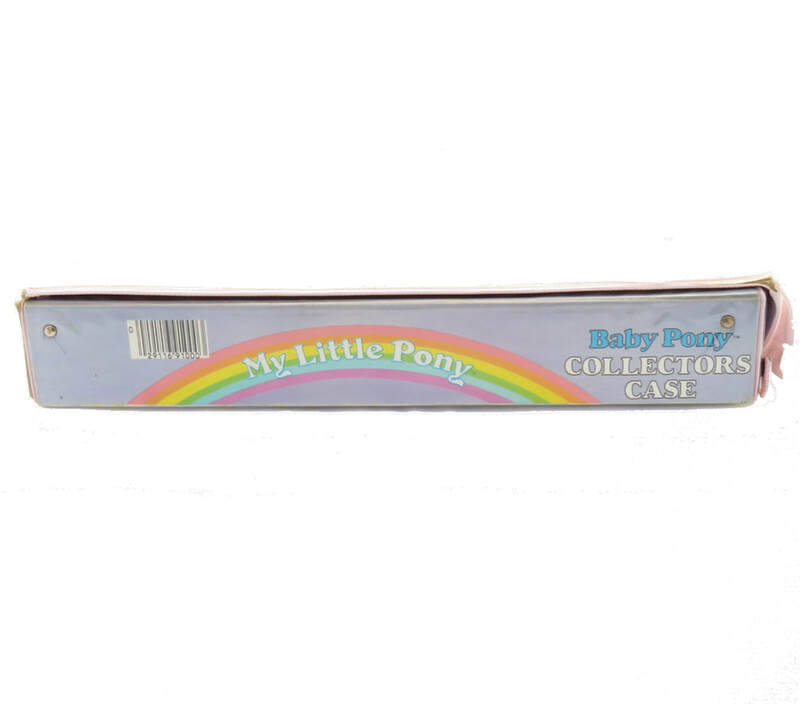 This gives it a more robust feel. 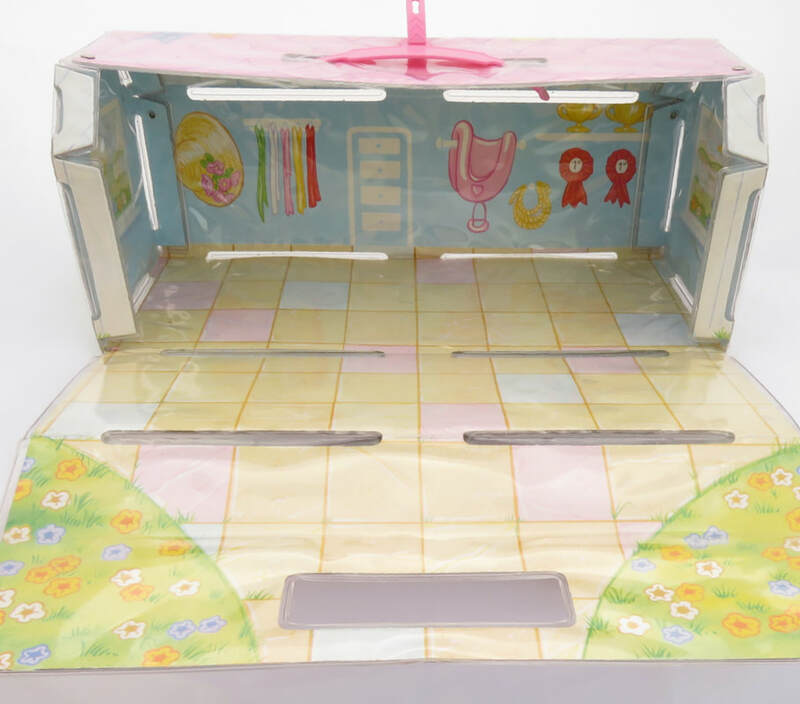 It has the original plastic stalls. 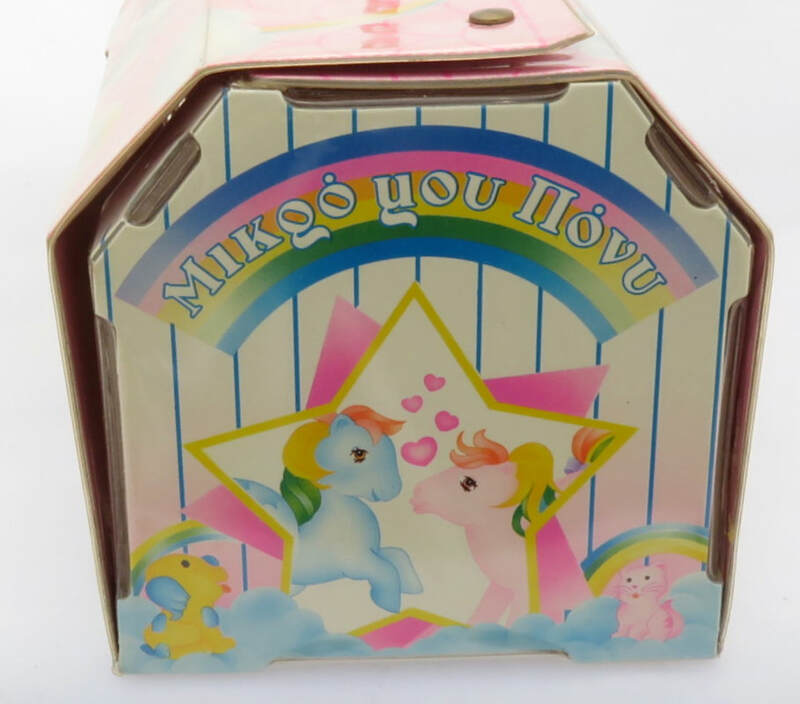 Appears to be the same design as the Danish and Greek Versions - please let me know if you can provide a picture. 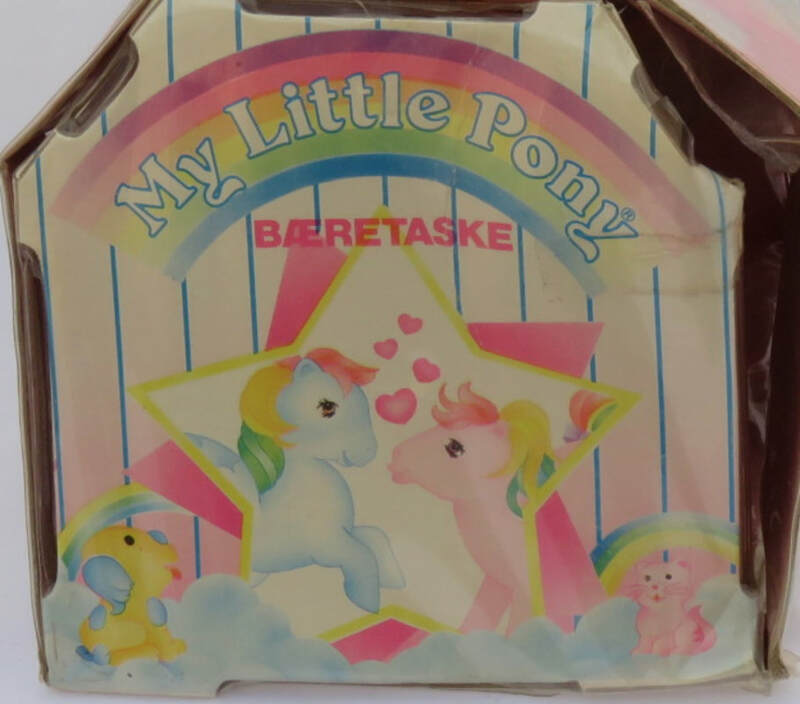 Also Came with Name Labels of a rainbow with a coloured heart behind it and the pony name and symbol across the rainbow.